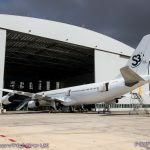 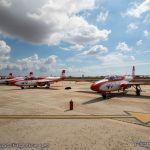 It was all-change for the 24th Malta International Airshow with a new event format and a totally new flying display venue. 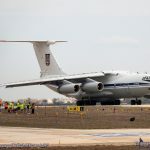 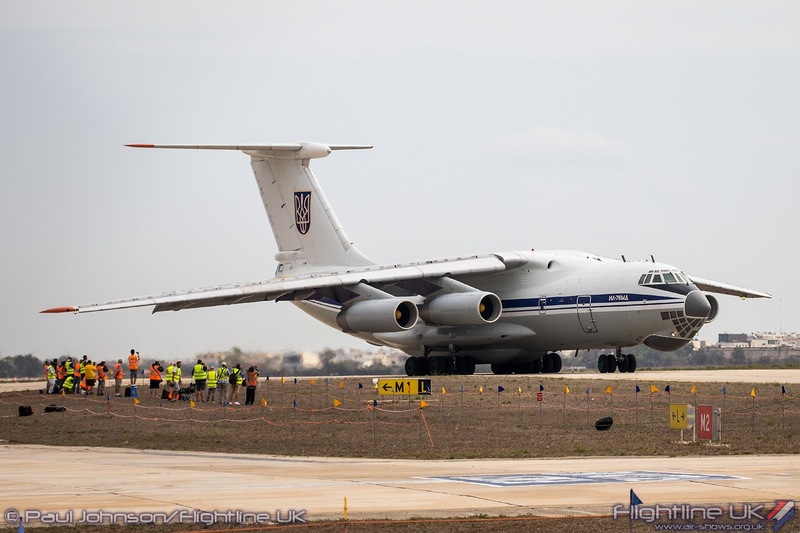 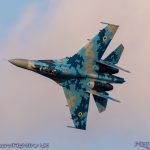 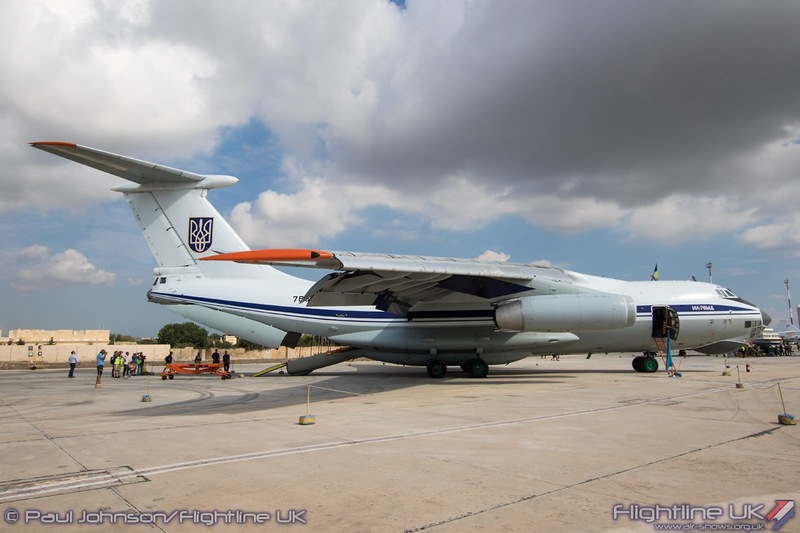 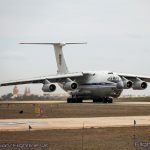 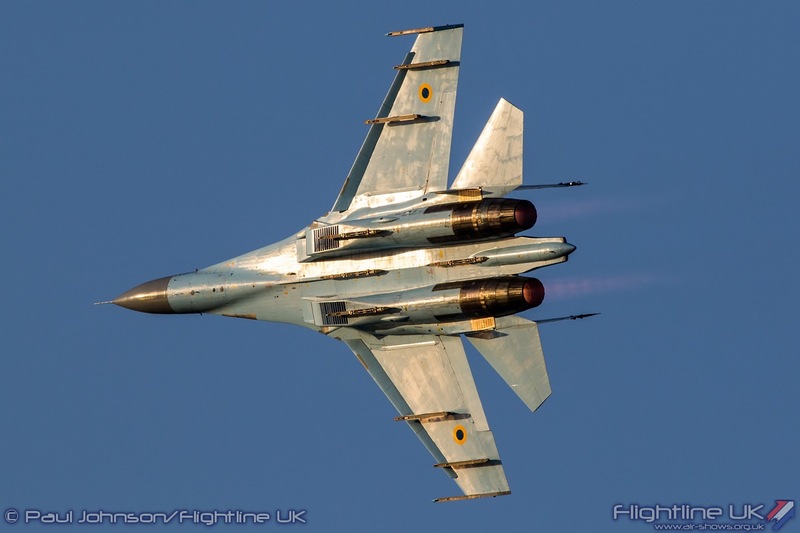 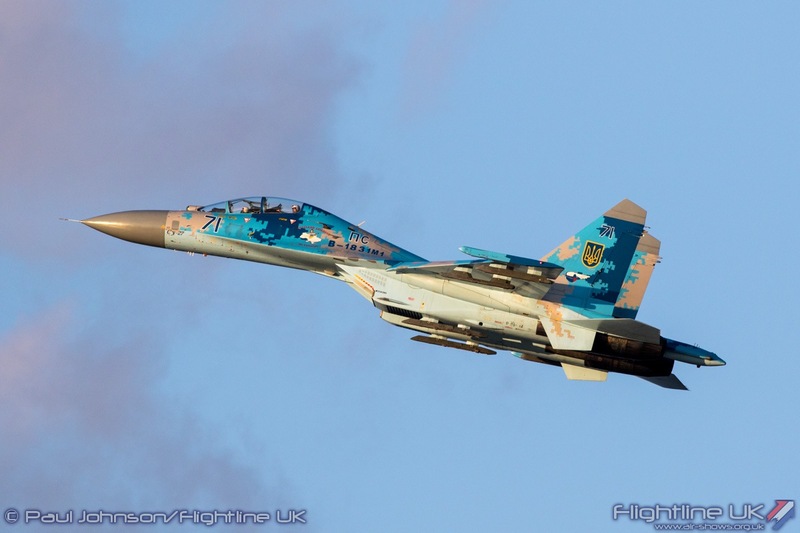 The show also welcomed the Ukrainian Air Force for the first time in a line-up that included aircraft from the UK, France, Poland and the United States of America. 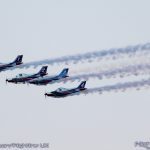 The show also battled with some unseasonably wet weather which ultimately led to the flying display being cancelled on the Sunday. 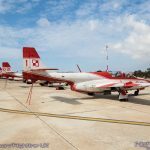 The Malta International Airshow is always a highlight of the European display season. 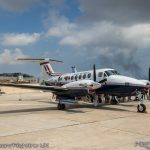 Not only does the show seem to always attract aircraft not often seen at other events, but it can be easily combined into a short (or long break) on the very welcoming Maltese Islands. 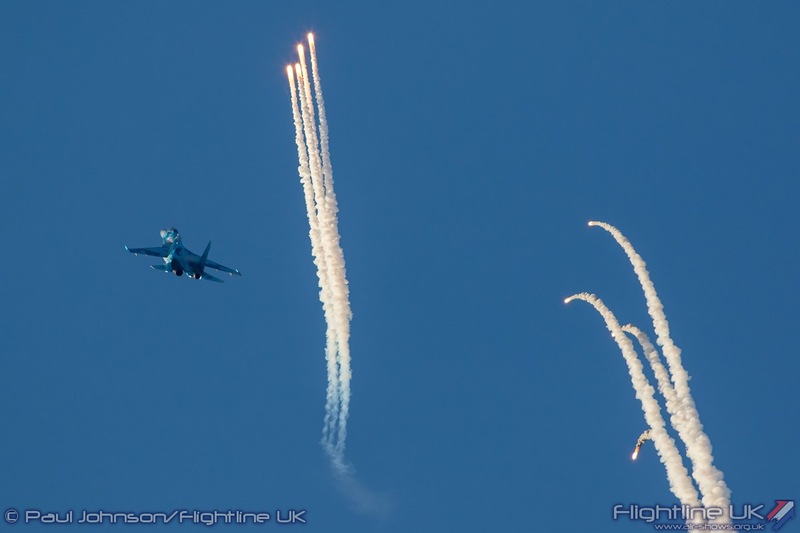 Post 2015, the environment for airshow organisers across Europe has been more challenging. 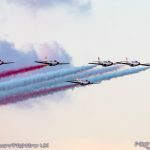 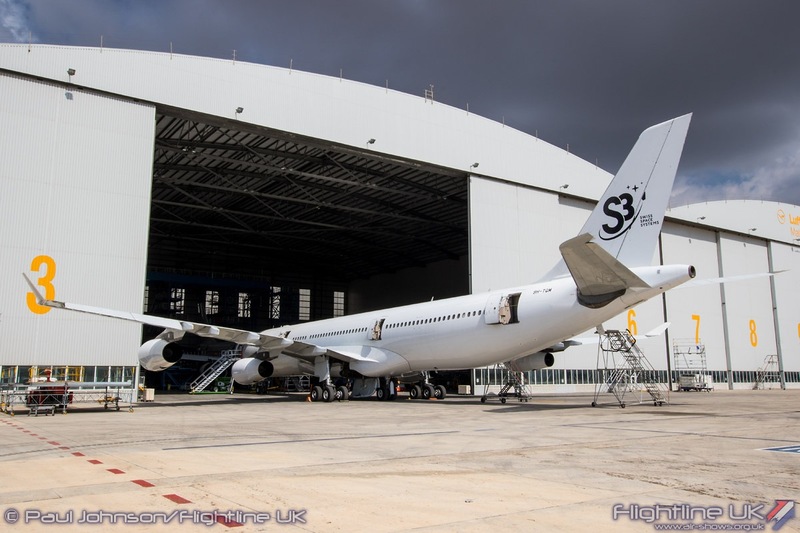 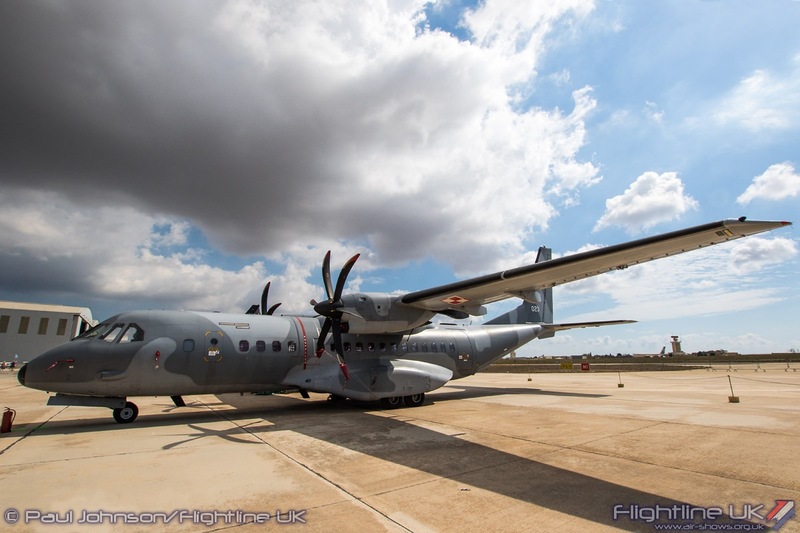 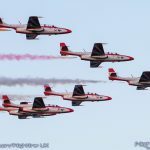 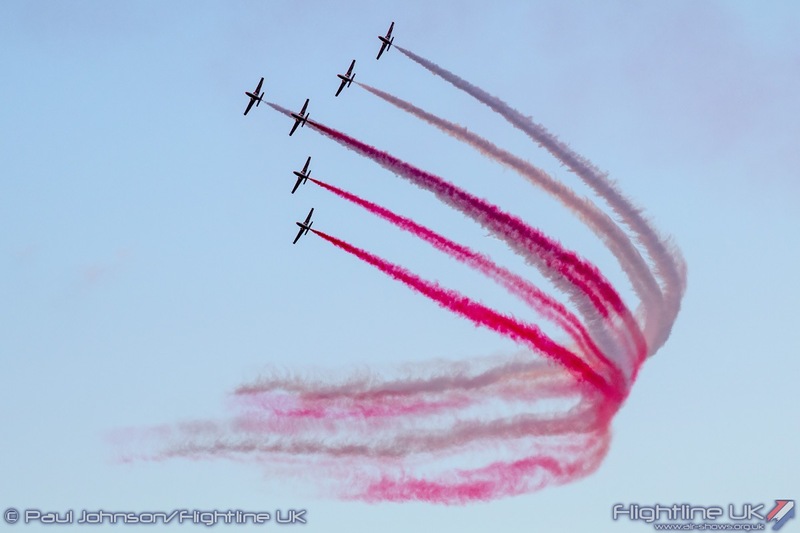 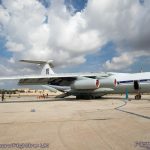 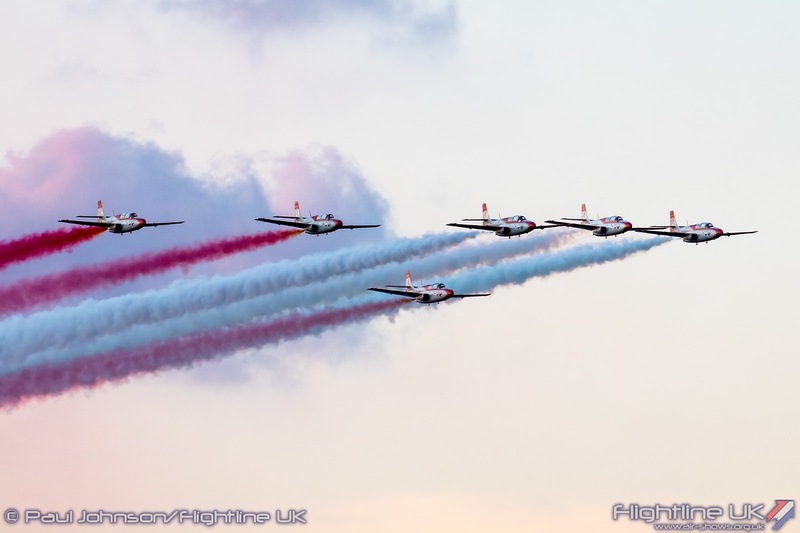 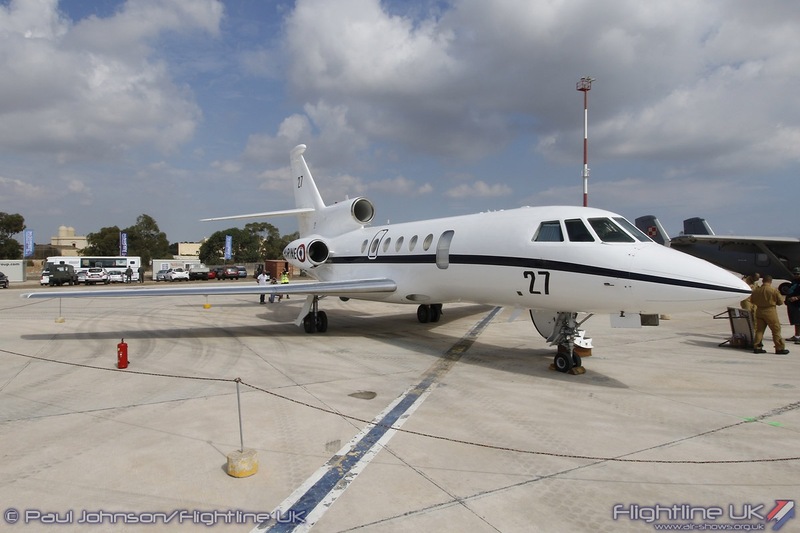 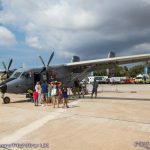 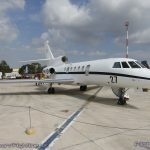 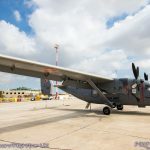 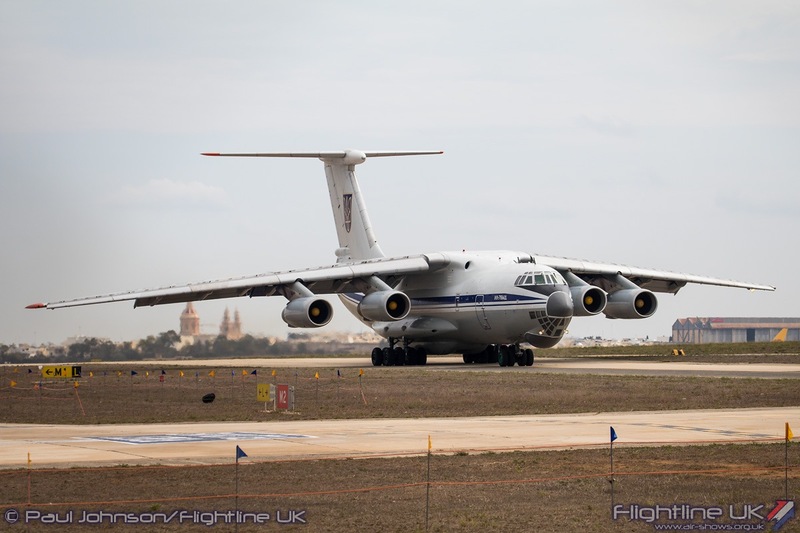 The Malta International Airshow 2015 held exclusively at Malta International Airport (MIA) ran smoothly and proved again to be a successful event. 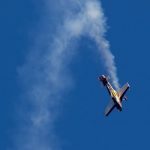 However in the week after the airshow, a car rally was held on the same showground as the airshow and an unfortunate accident led to 23 people being injured. 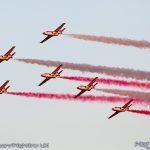 Though this event had absolutely nothing to do with the airshow, the accident appears to have led to some concerns about major ‘action’ events taking place at the airport and the decision by officials to force the flying displays to move to coastal location. 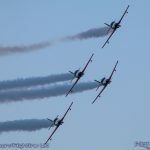 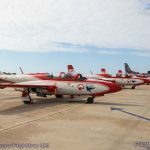 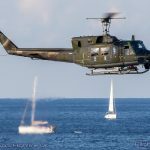 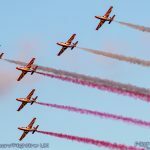 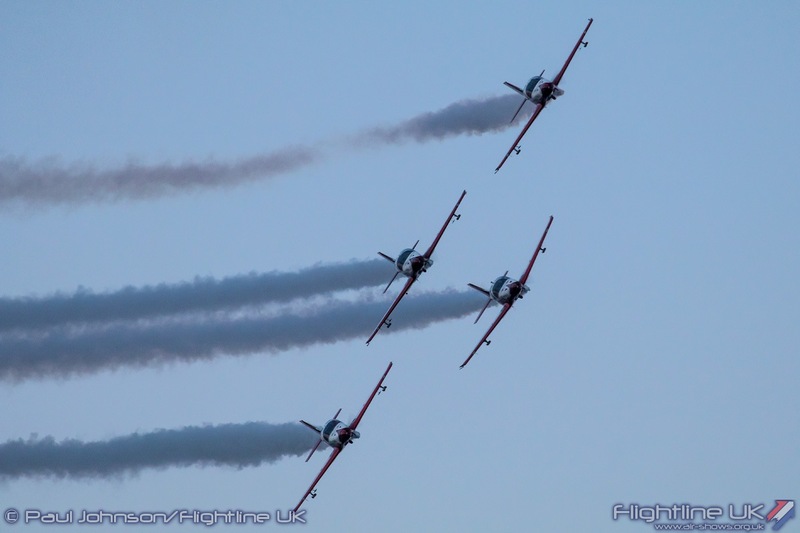 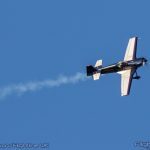 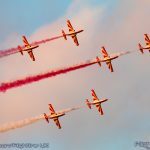 Seaside flying displays are nothing new to the Malta International Airshow which has been held at a number of different coastal venues during its history. 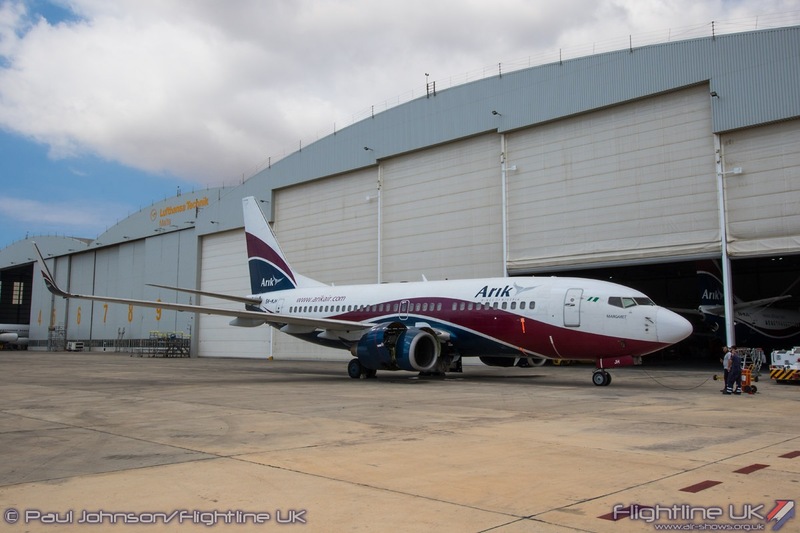 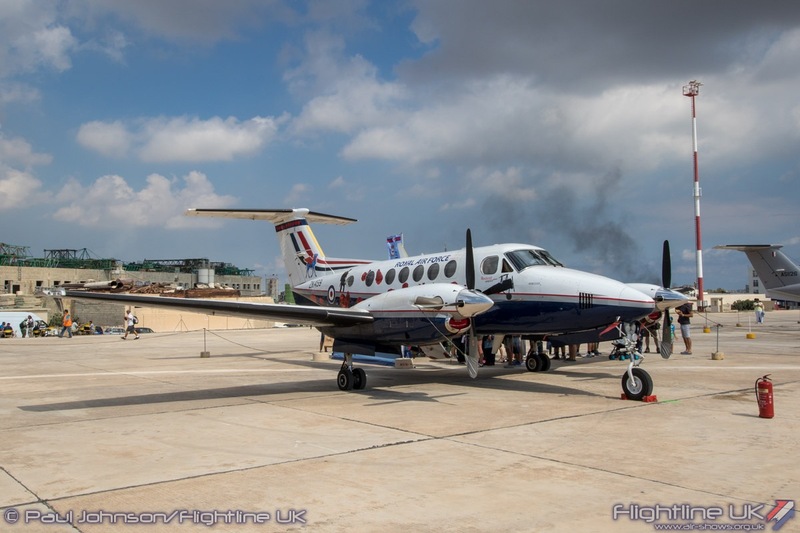 But the event really had made a home at the airport and for some, the opportunity to see the display aircraft and crews on the ground would be missed. 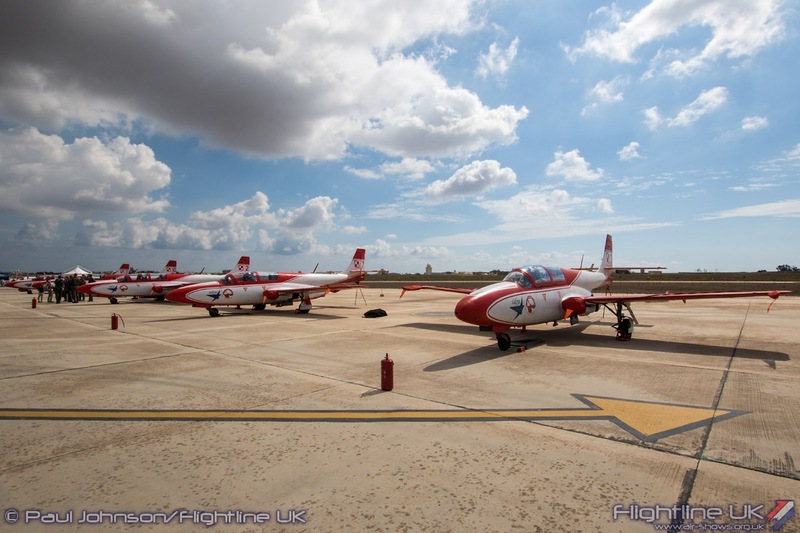 The move also complicates matters for the event organisers, the Malta Aviation Society, who fund the event. 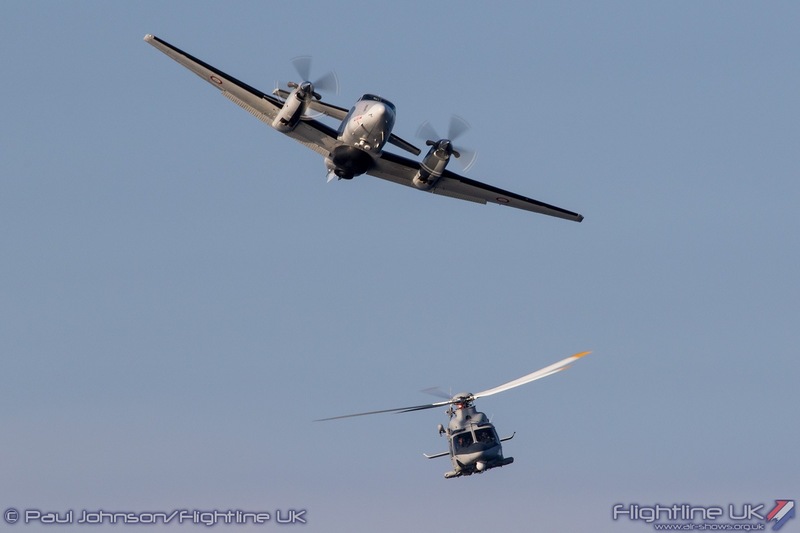 With the event held at the airfield, they can charge admission for the entire event. 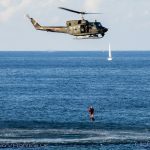 Moving to a seafront location makes that nearly impossible without some major expense on infrastructure and policing. 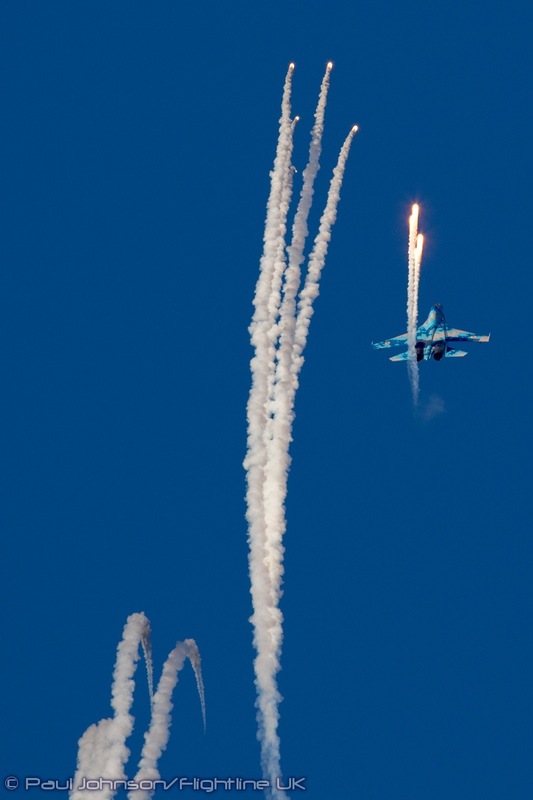 The compromise for 2016 was to split the event in half. 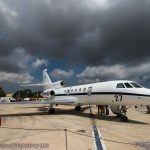 Both mornings of the airshow saw the static park opened up to the public for a small fee of €8. 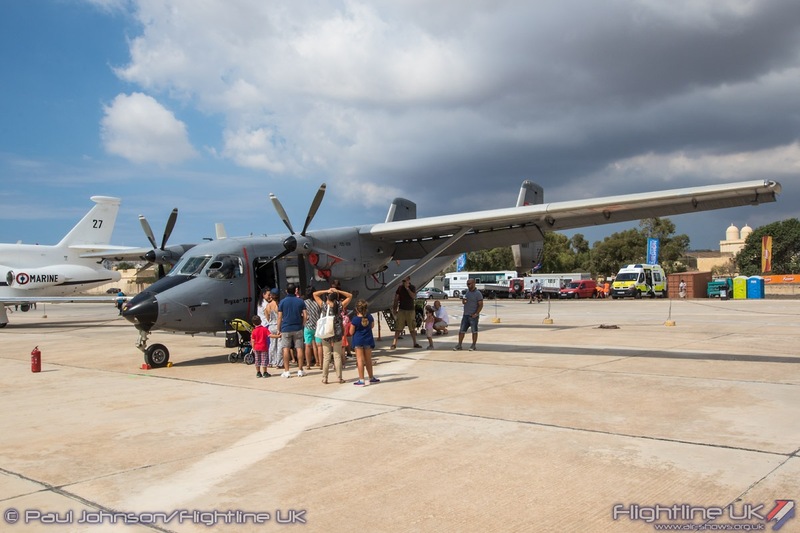 This stayed open until the early afternoon allowing the public a good chance to view the aircraft close up, chat to crews and buy a few souvenirs from participating units and a small selection of trade stands. 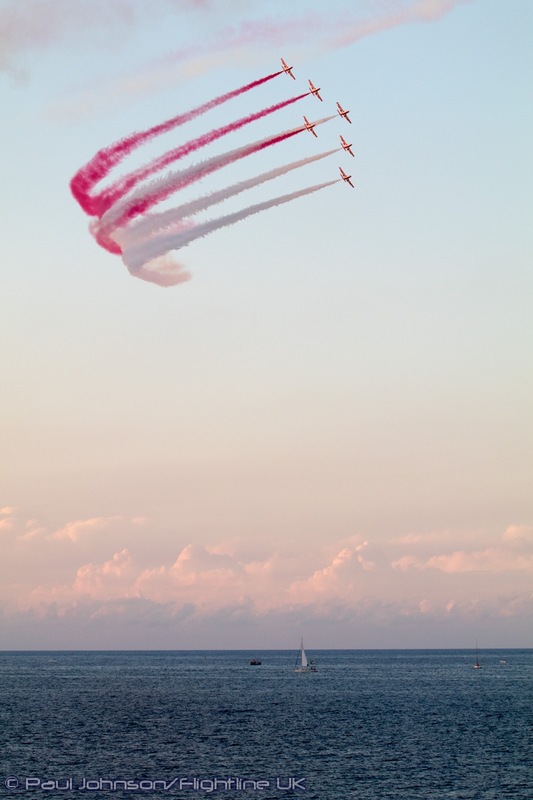 Late afternoon saw the flying display being held alongside the coastline at Malta’s new “SmartCity” development. 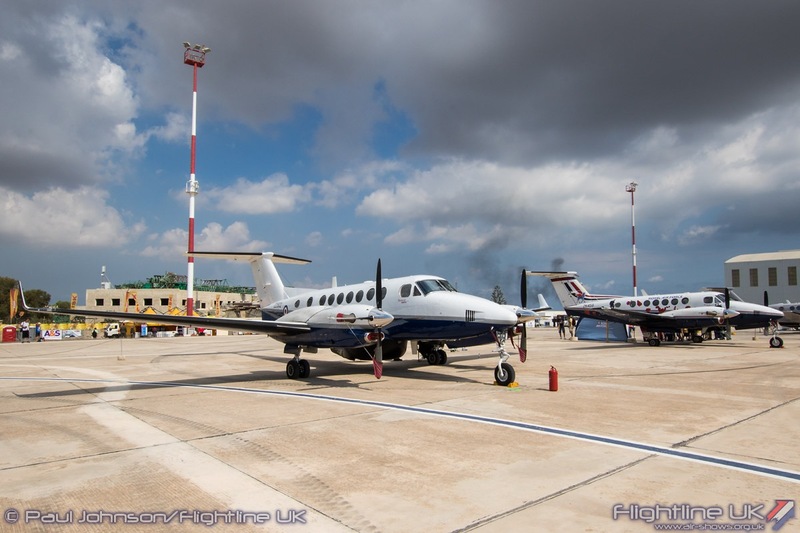 Situated just south of the capital Valetta, SmartCity is a new area combining a Business Park and Leisure facilities. 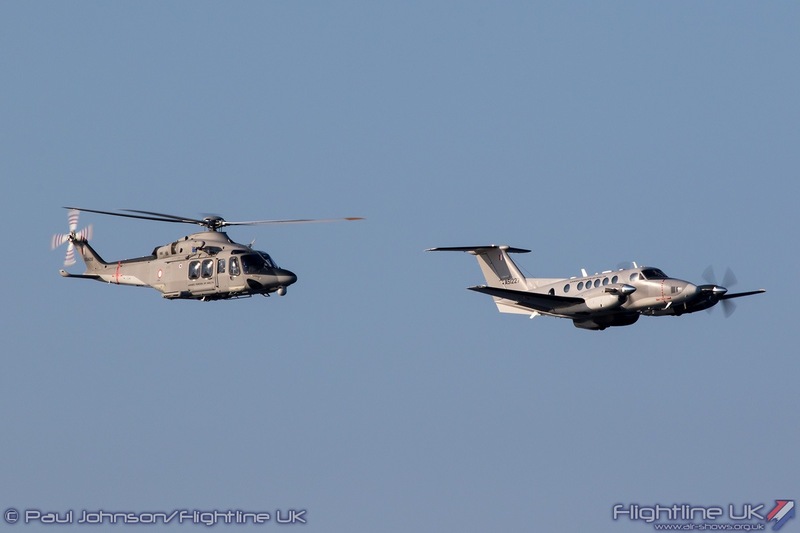 A very spectacular central water feature is flanked by two large ultra-modern office blocks. 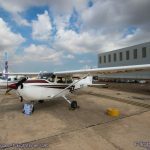 At the foot of the office complex is a selection of bars, restaurants and shop units. 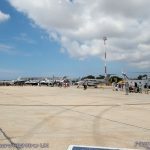 The site is still work in progress and no doubt the decision to move the airshow here in part was to promote SmartCity for future development. 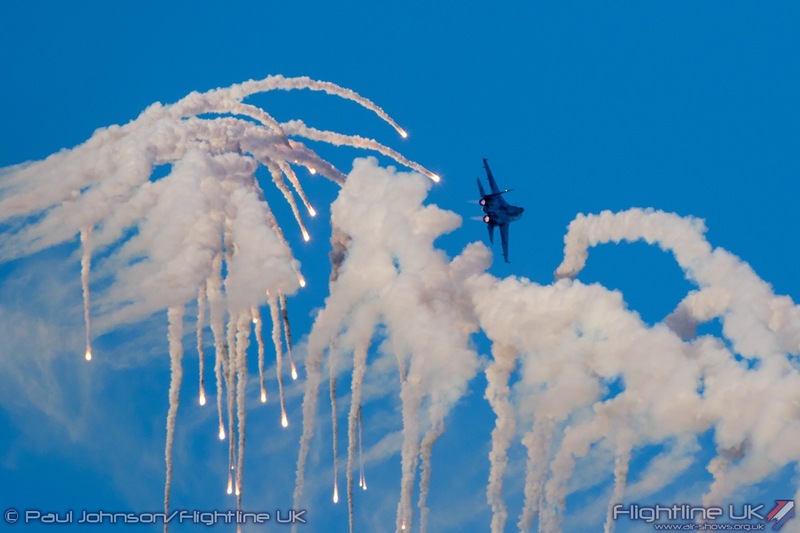 As an airshow venue it was certainly different, and despite some initial concerns it actually worked very well. 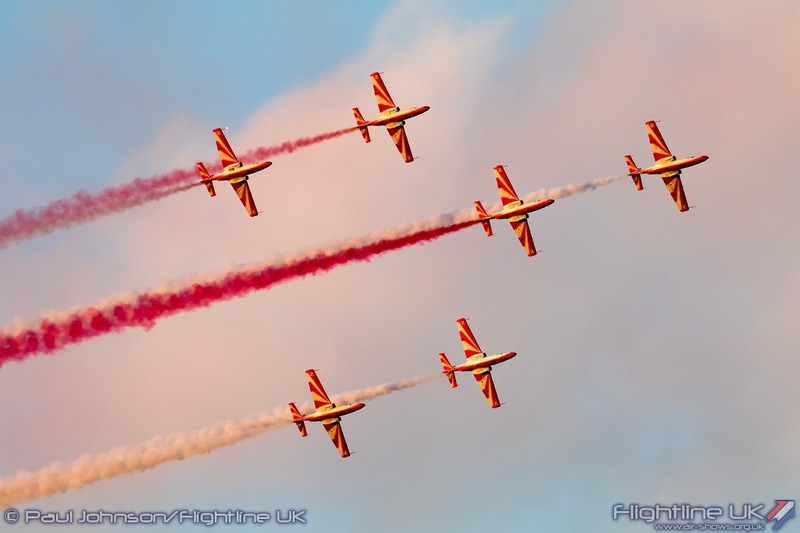 It was a compact display line with the late afternoon sun behind the crowd all the time – perfect for photography. 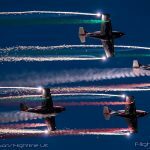 Another advantage of being away from the airport meant the flying display ran continuously making for a far better spectacle. 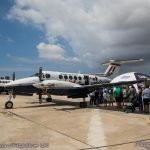 Though I used a hire car to get around organisers had promoted public transport as the main means of getting to and from the venue and this did appear to be slightly swamped after the flying display. 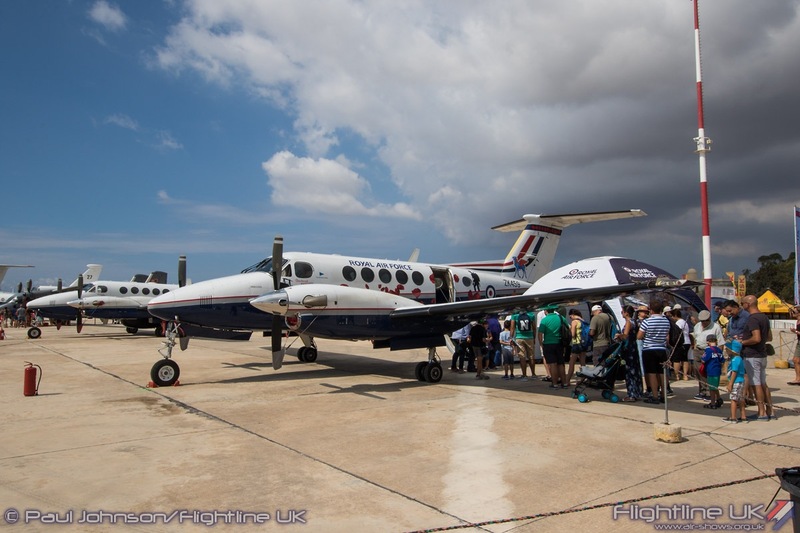 Perhaps a more robust scheme of public transport will be required if future events are held here (as well as better signage!) 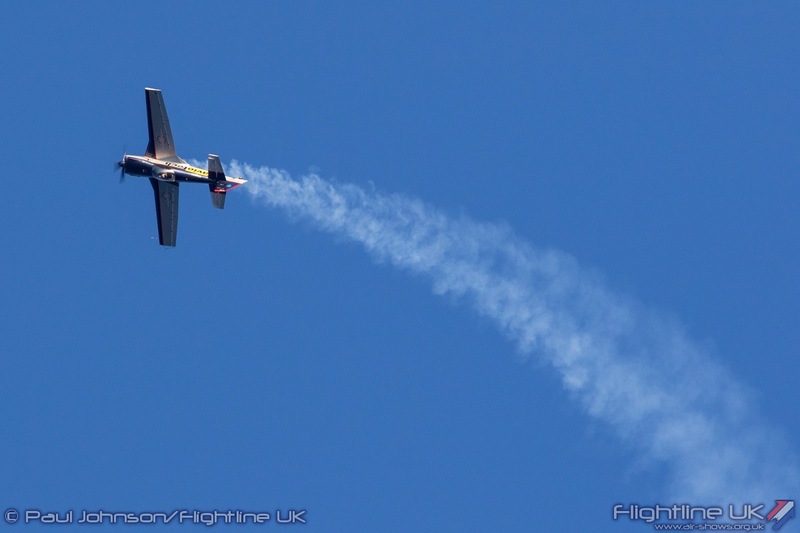 Overall though, the novelty, continuous flying and compactness of the venue made for a very enjoyable flying display. 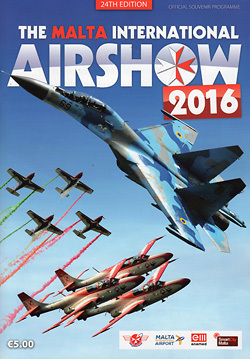 The scale of aircraft participation was certainly down on previous years, perhaps as result of the significant changes to the show format. 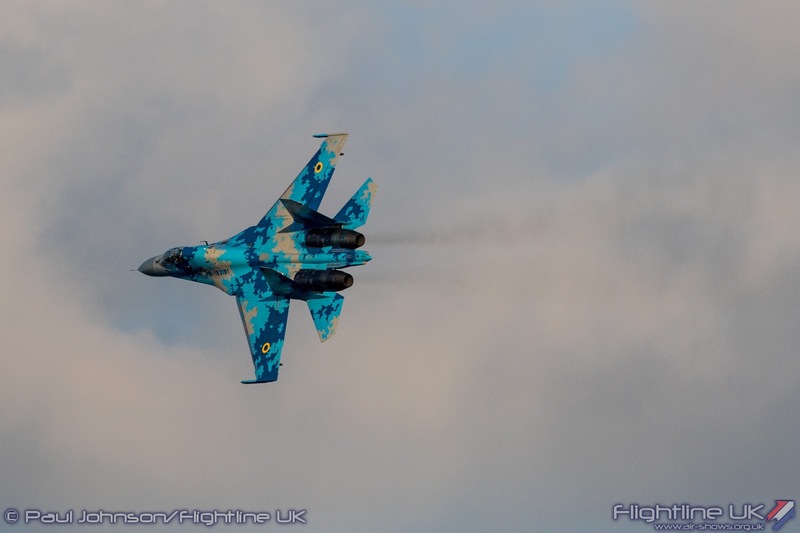 However, it was full of quality items making rare airshow appearances. 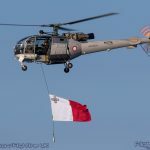 As always, Maltese Aviation was to the fore with participation from the Armed Forces of Malta (AFM) and the various flying schools and clubs based on the Islands. 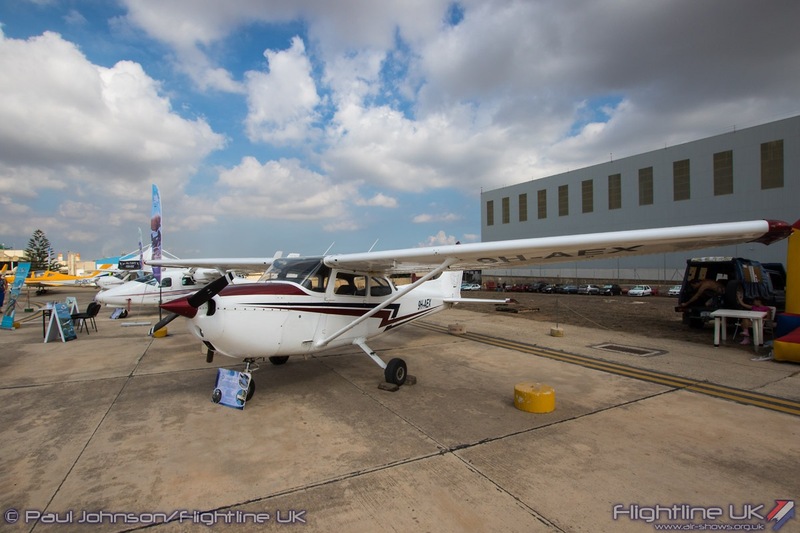 Amongst the club aircraft were Cessnas, Tecnams, Diamond DA42 Twin Stars and various microlights. 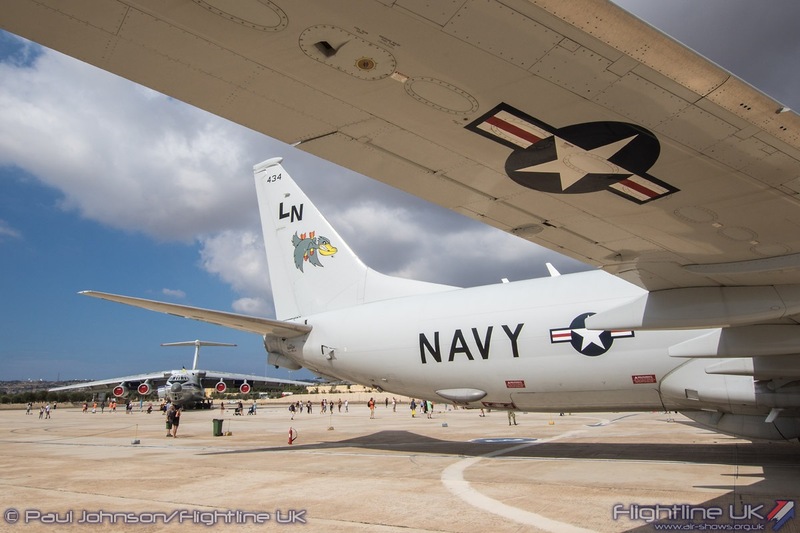 The small selection of aircraft that gathered just for the static display mainly had links to maritime aviation. 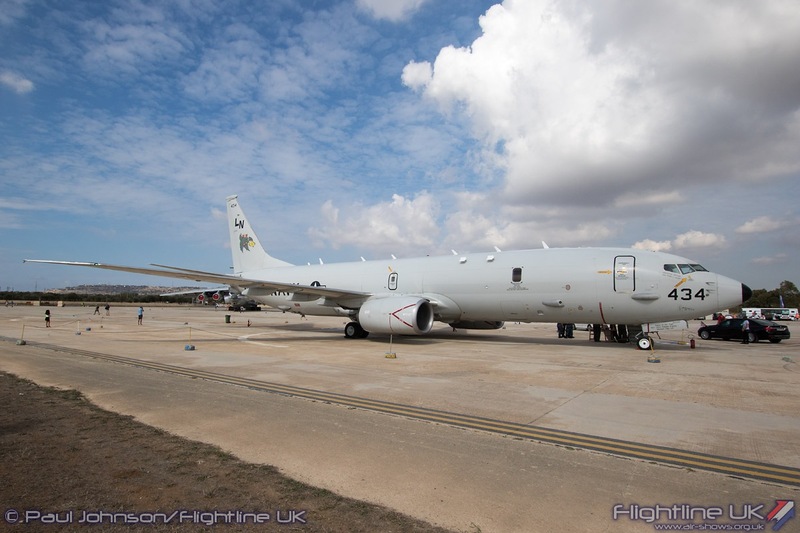 One of the big stars of the static was the first Maltese appearance by a US Navy Boeing P-8A Poseidon. 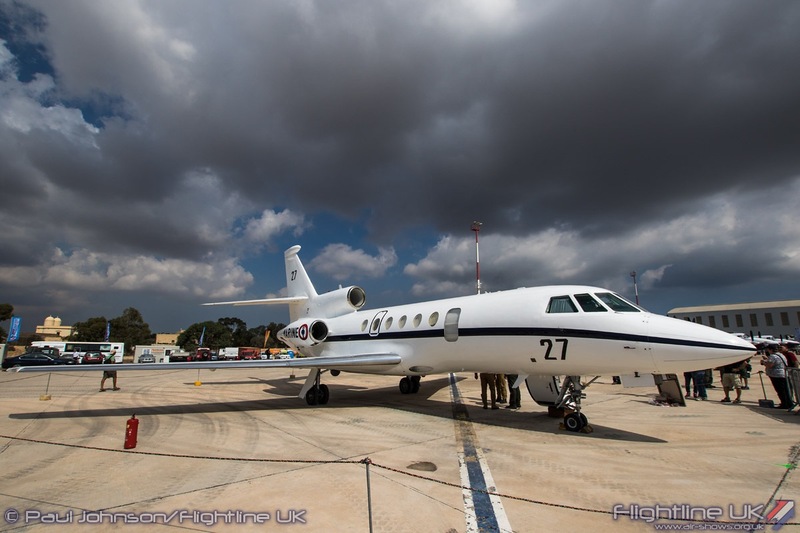 The aircraft came from VP-45 which had a detachment at NAS Sigonella during the show. 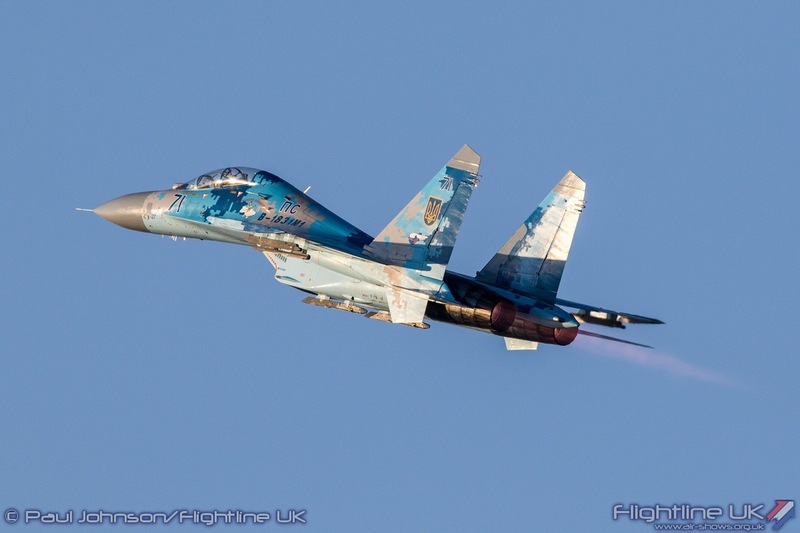 VP-45 are known as the ‘Pelicans’ and the aircraft carry some striking tail-art showing a bomb-laden Pelican. 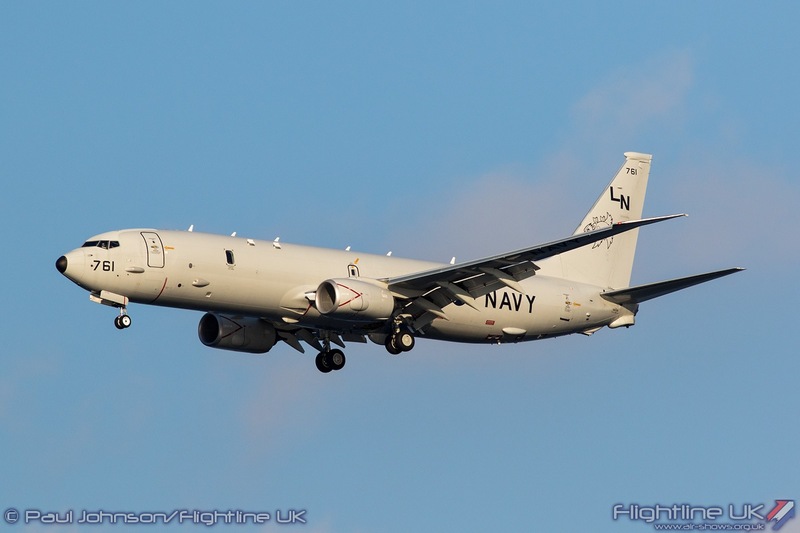 The squadron is normally based at NAS Jacksonville, Florida. 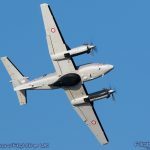 Another star maritime patrol aircraft was the Dassault Falcon 50M Surmar from the French Navy. 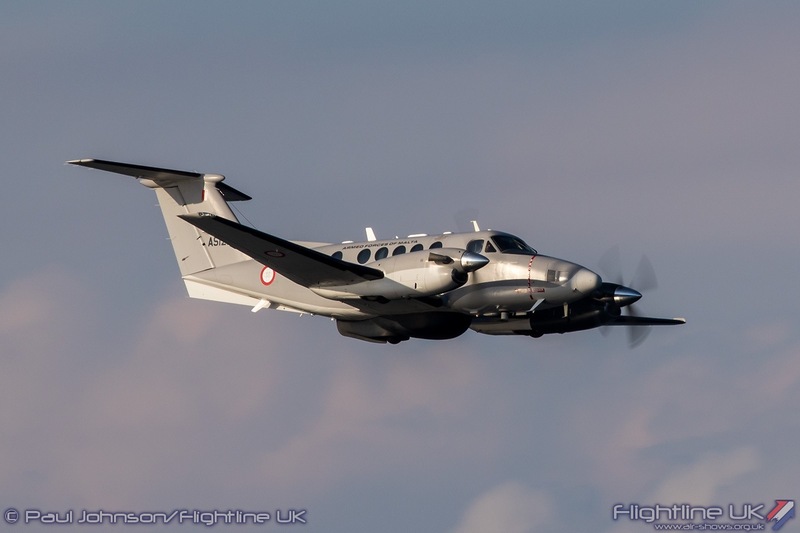 From 24 Flotille, the Falcon 50M is a very rare aircraft to see at a European event as they are often deployed to the Caribbean and the Indian Ocean in support of Anti-Piracy operations, Fisheries Patrol, Anti-narcotics operations plus Search and Rescue missions. 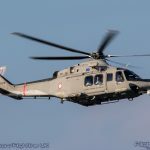 A late arrival on Saturday was a Portuguese Air Force Airbus Military CN295MP which was on display during Sunday’s raining static display session. 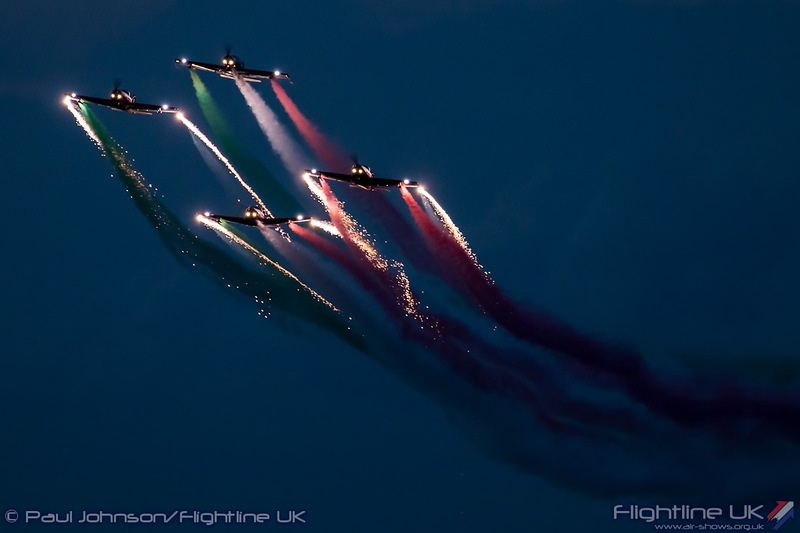 The event saw strong support from the Polish Air Force and Navy. 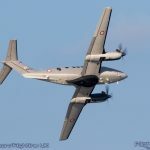 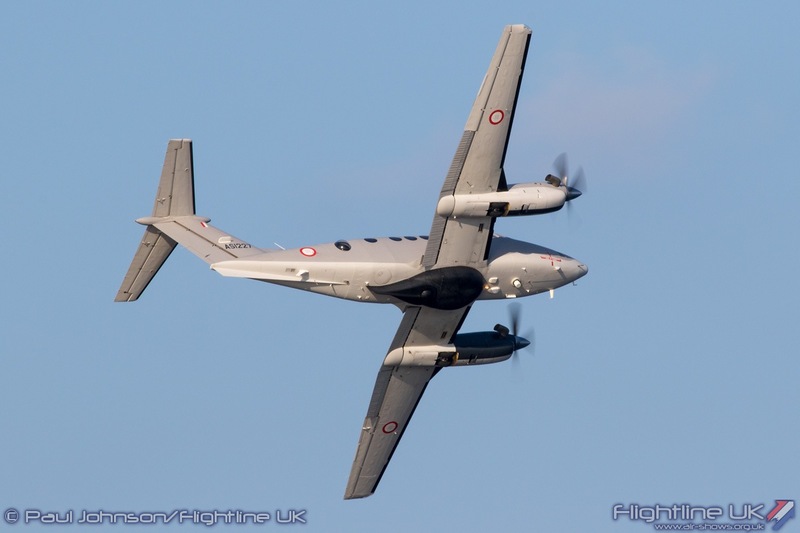 The latter also contributed to the Maritime Patrol theme with the return of a PZL/Antonov An-28M1R Bryza. 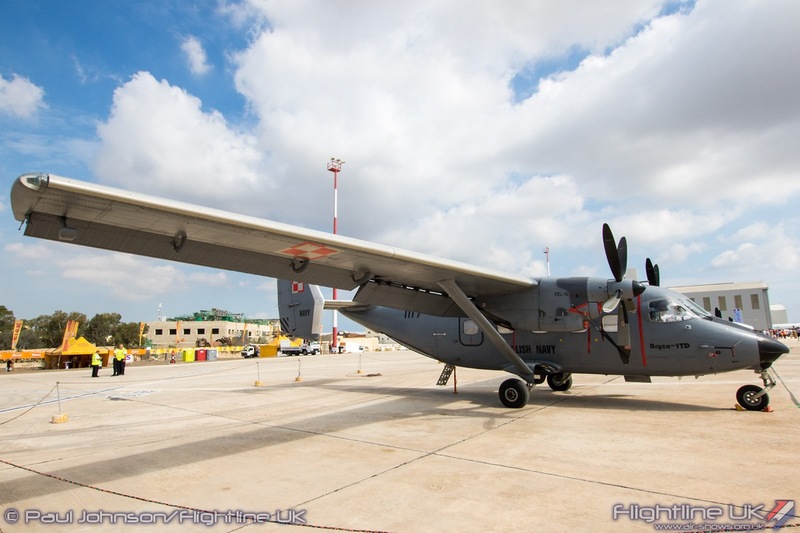 The Polish Air Force also contributed to the static display with an Airbus Military CN295M. 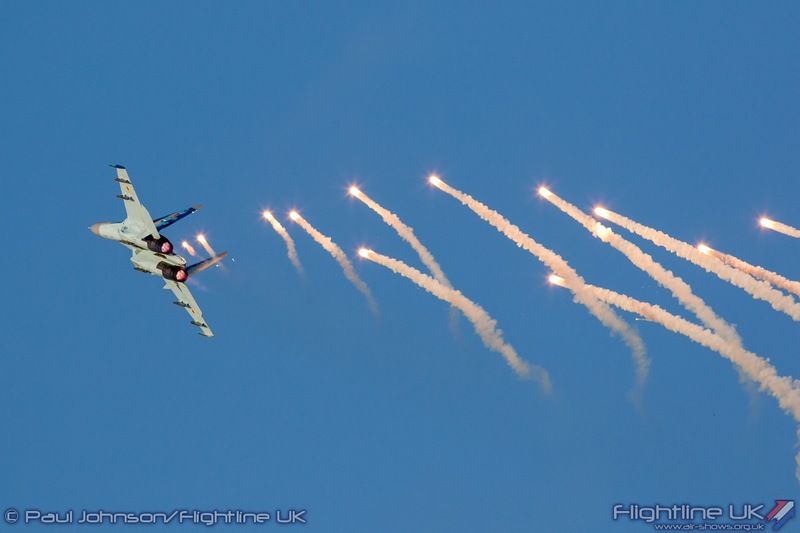 Participation from the UK was notably down on previous years. 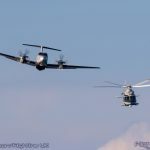 However both the Royal Navy and Royal Air Force contributed to the static displays with aircraft from their training fleets. 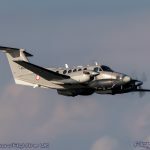 The Royal Navy’s 750 NAS maintained their association with the Maltese Islands by sending one of the Beechcraft Avenger T1 observer and rear crew trainers. 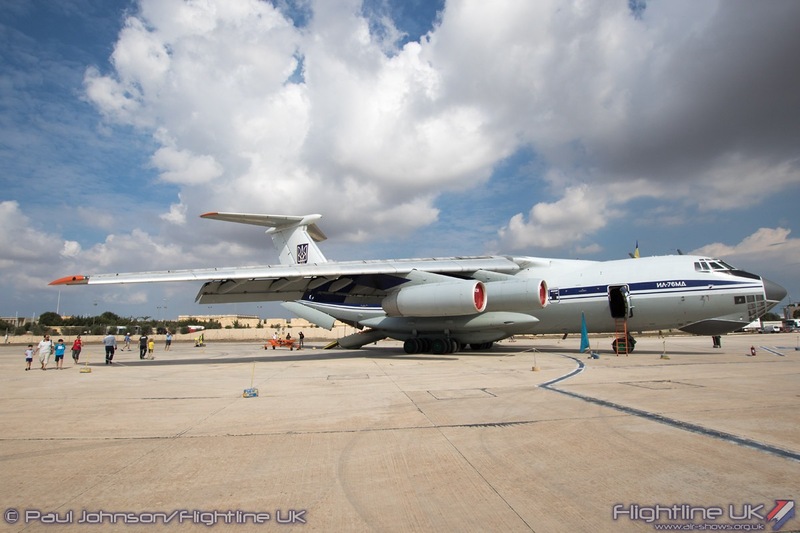 750 NAS and observer training was based in Malta during the early stages of the Cold War at RNAS Hal Far. 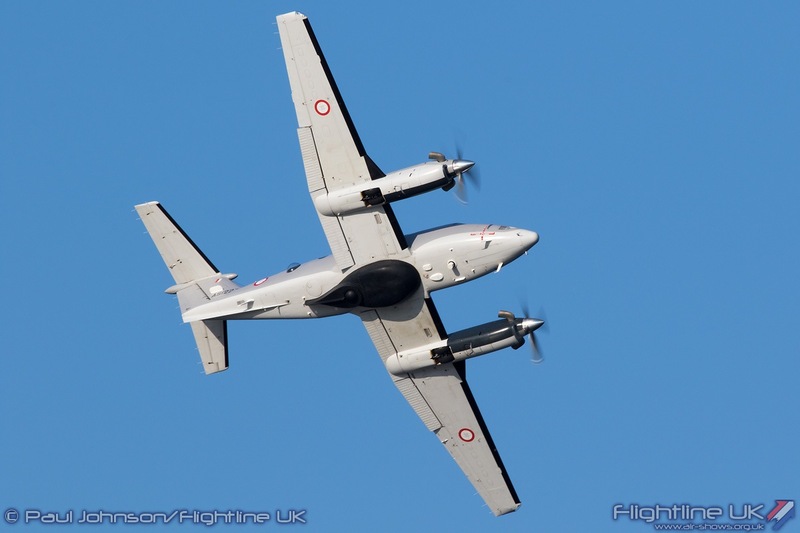 Then they primarily flew the Percival Sea Prince T1 but latterly added the de Havilland Vampire and Sea Venom for high level and fest jet crew training. 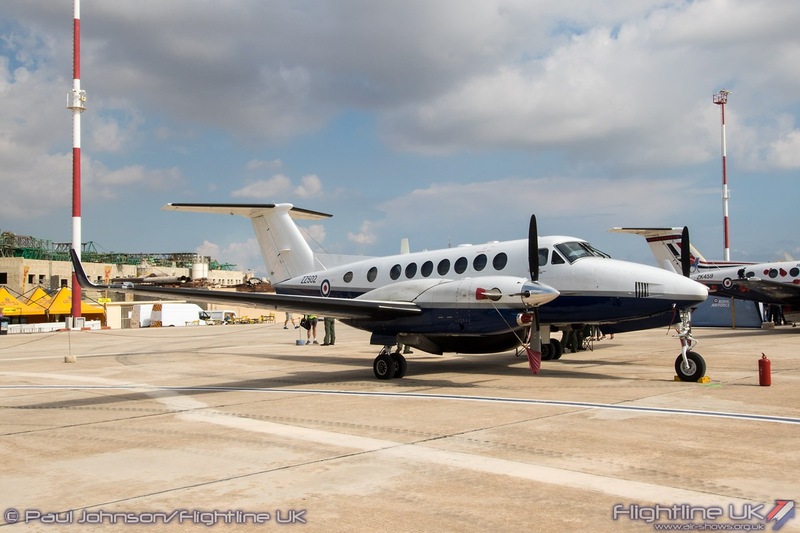 The Royal Air Force was represented by 45[R] Squadron with the Beechcraft King Air B200GT. 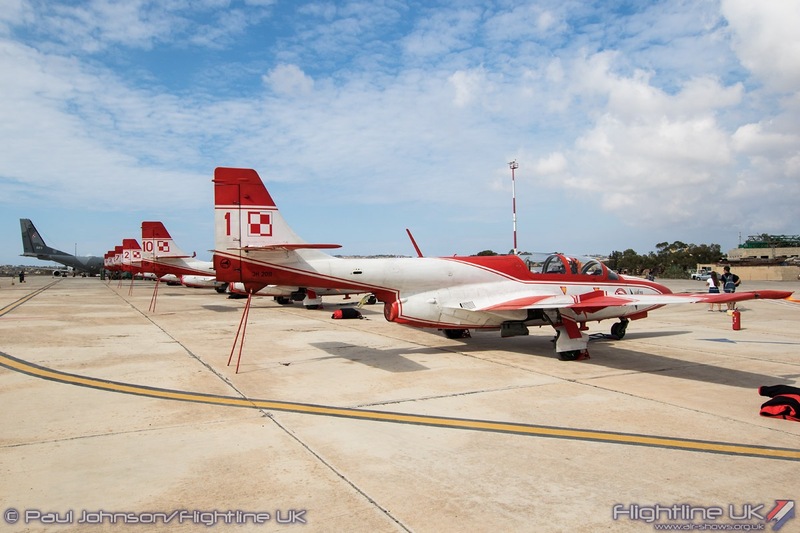 Malta was lucky enough to see the squadron’s specially painted aircraft which marking the centenary of the squadron with marking reflecting on the units First World War history. 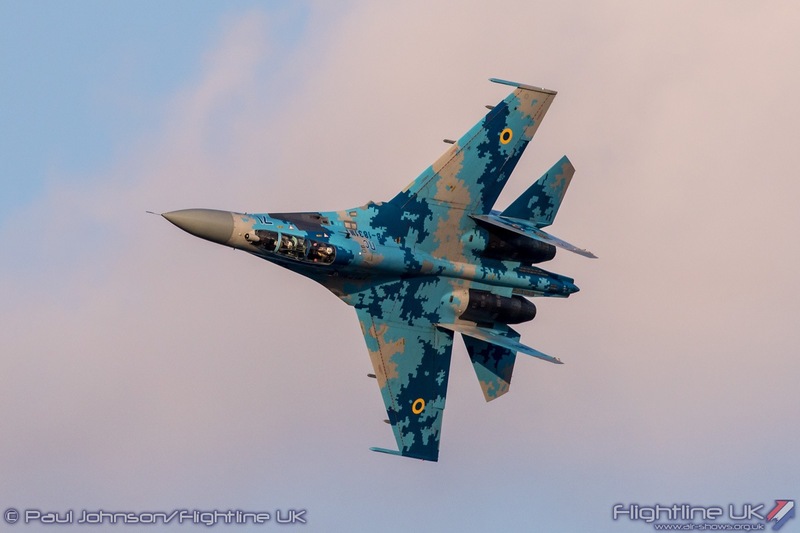 However it was the Ukrainian Air Force that provided the main attraction in the static displays. 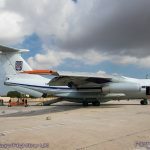 Towering over all the other aircraft was an Illuyshin Il-76MD Candid transport which brought the support equipment and personnel for a pair of Sukhoi Su-27 Flankers. 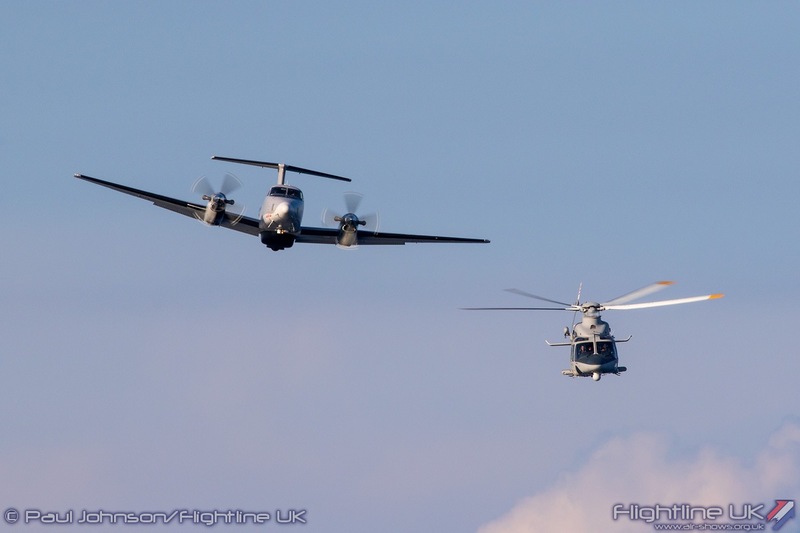 The trio made a spectacular arrival with a low level flypast down MIA’s main runway. 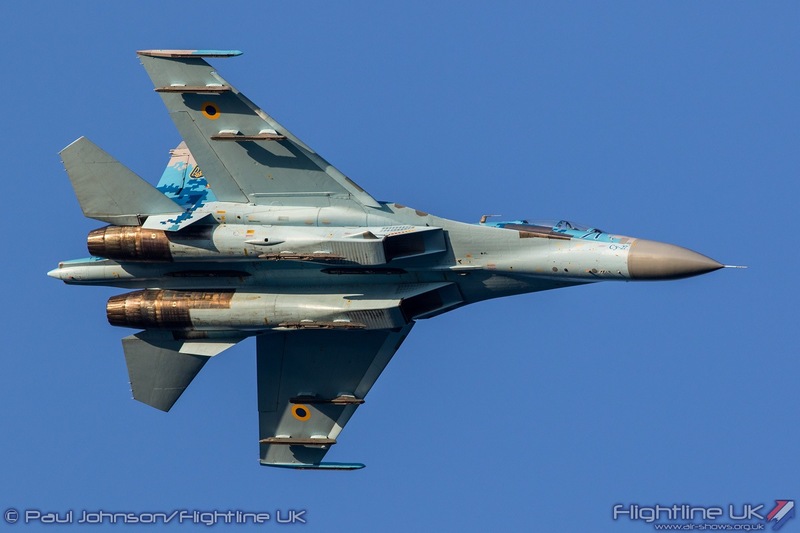 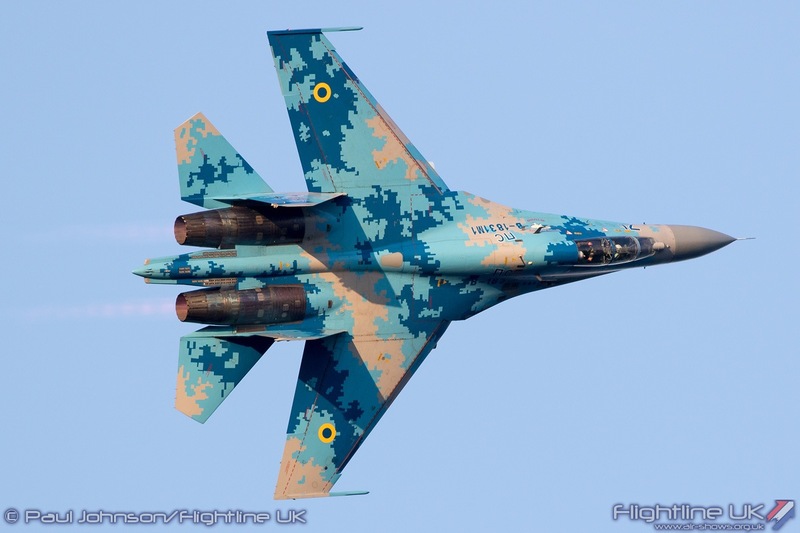 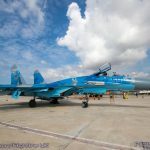 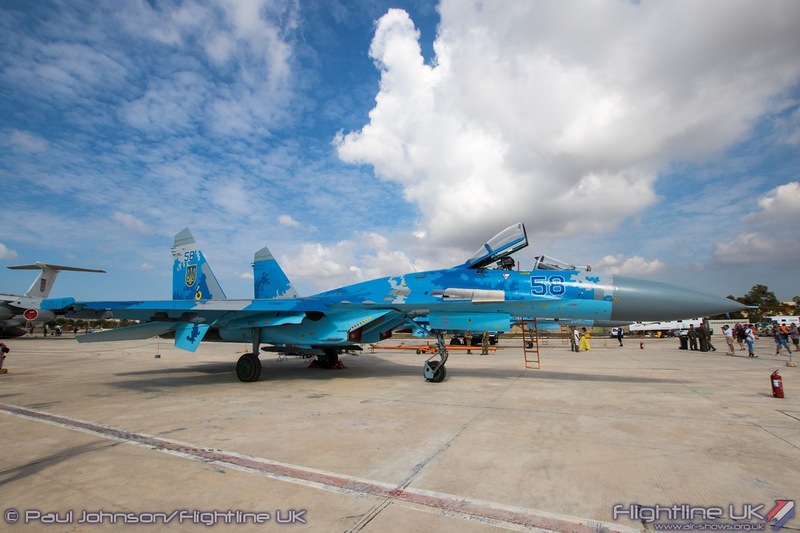 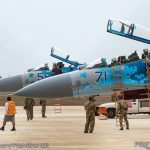 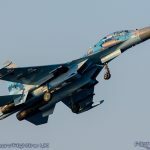 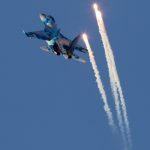 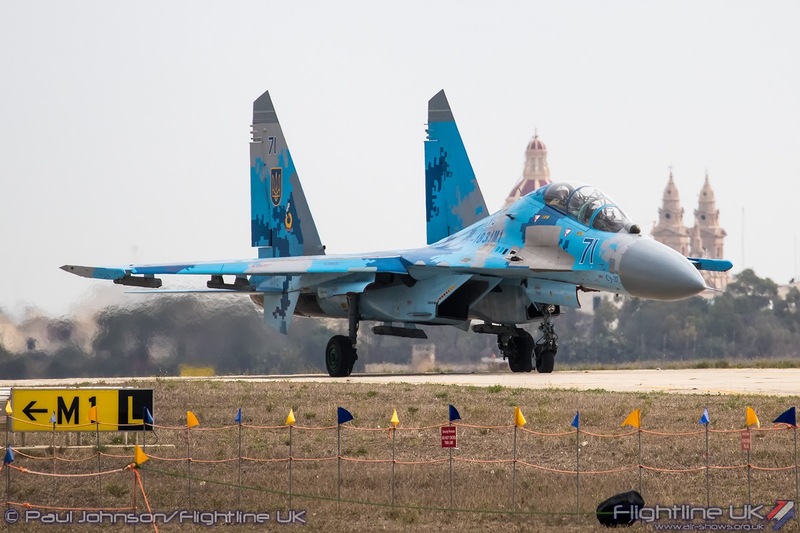 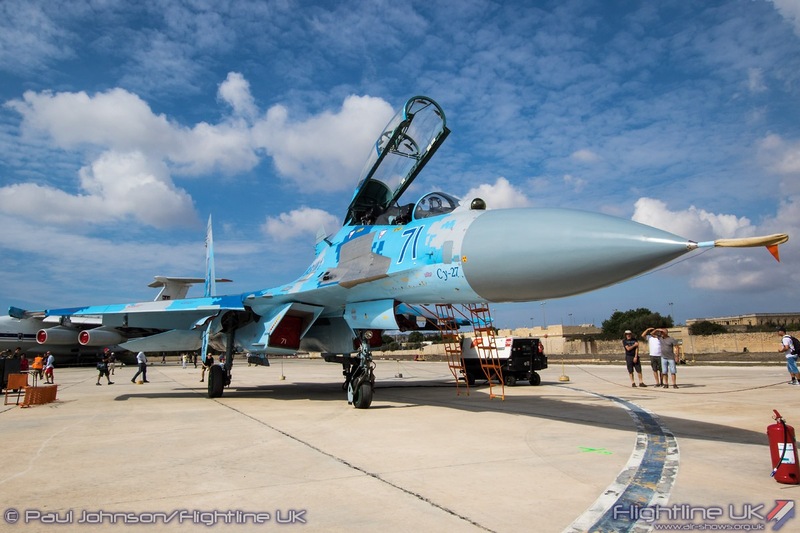 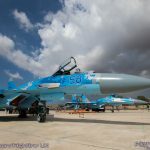 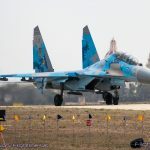 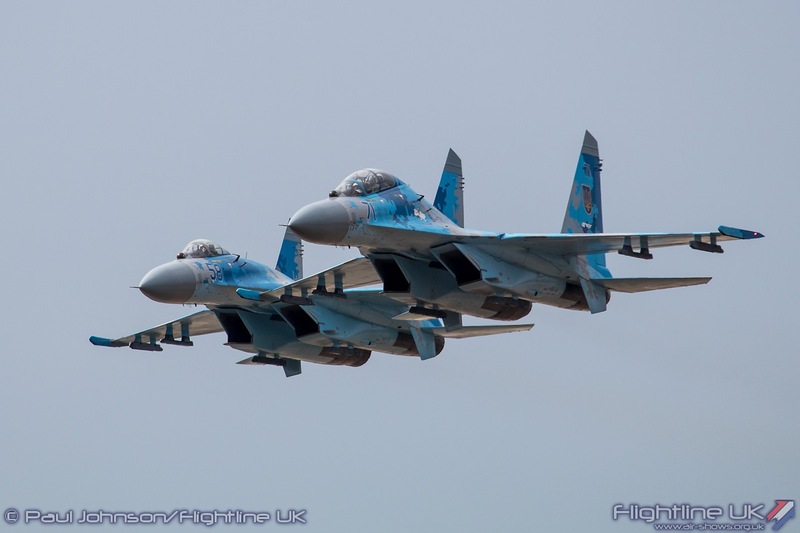 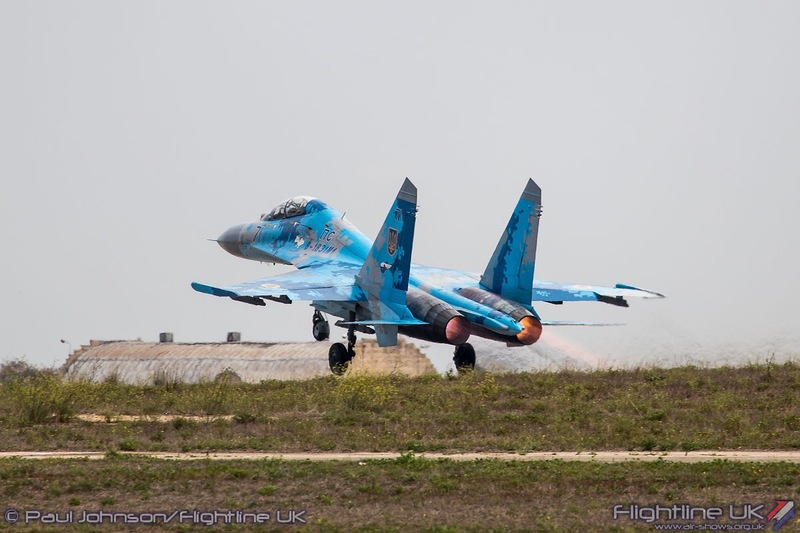 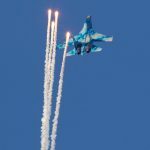 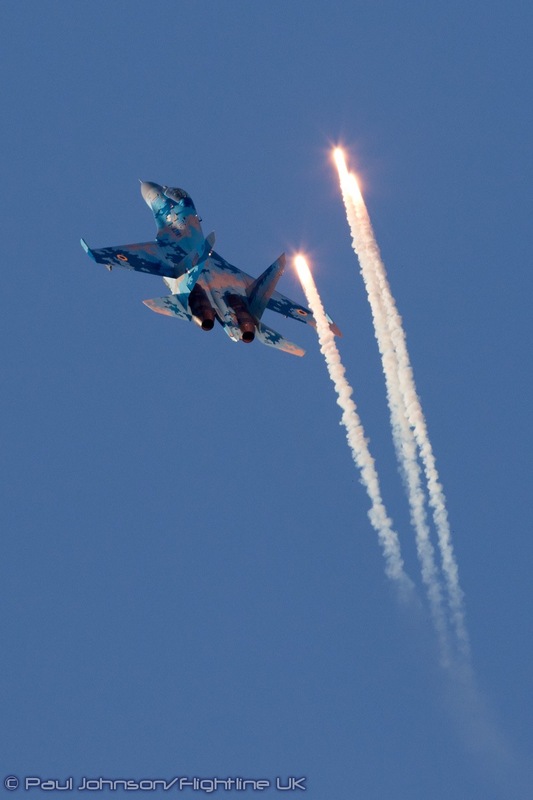 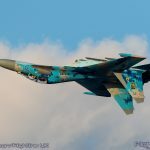 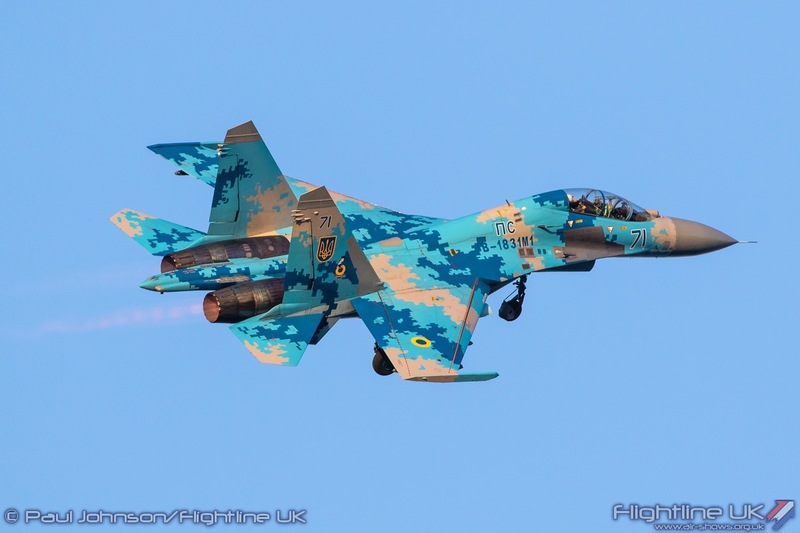 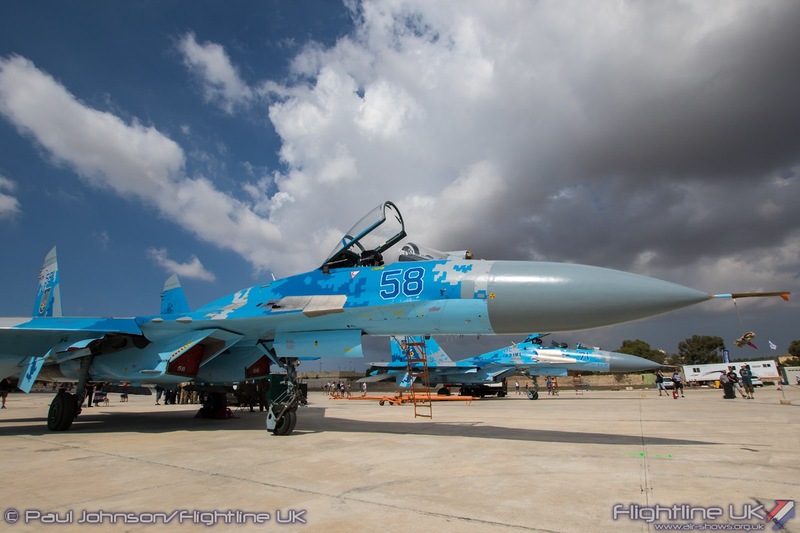 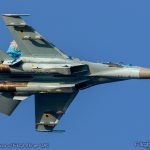 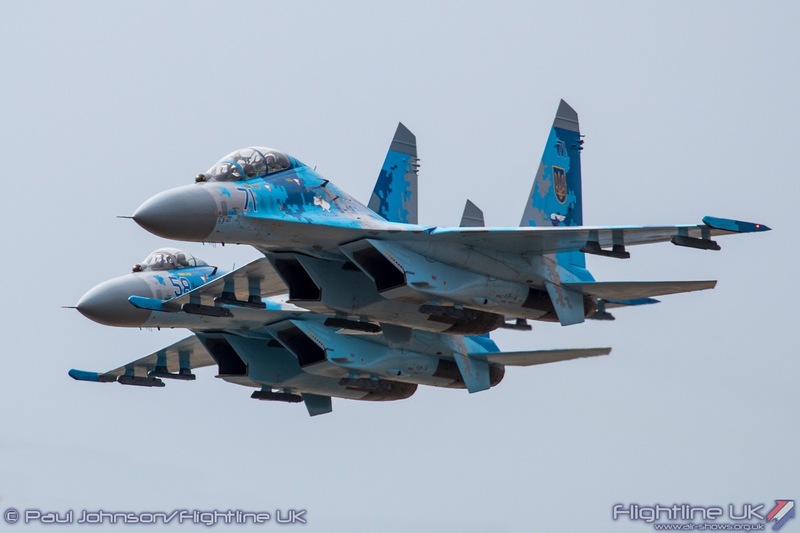 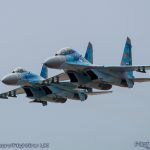 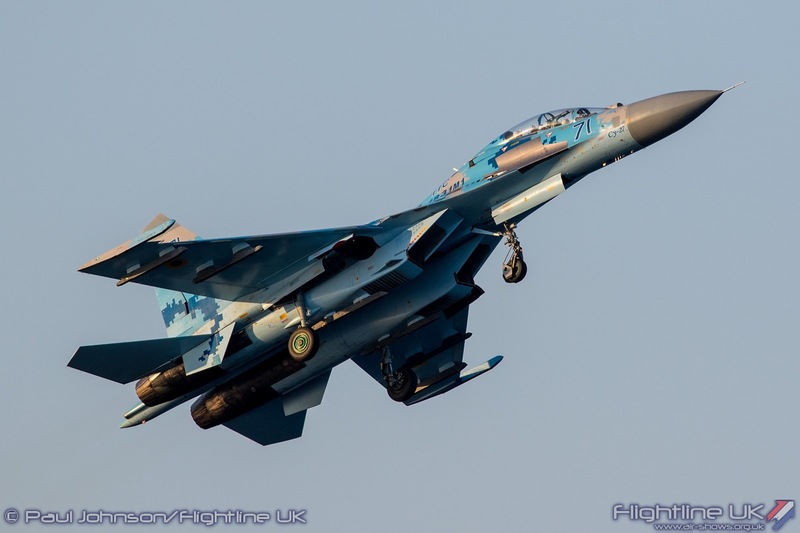 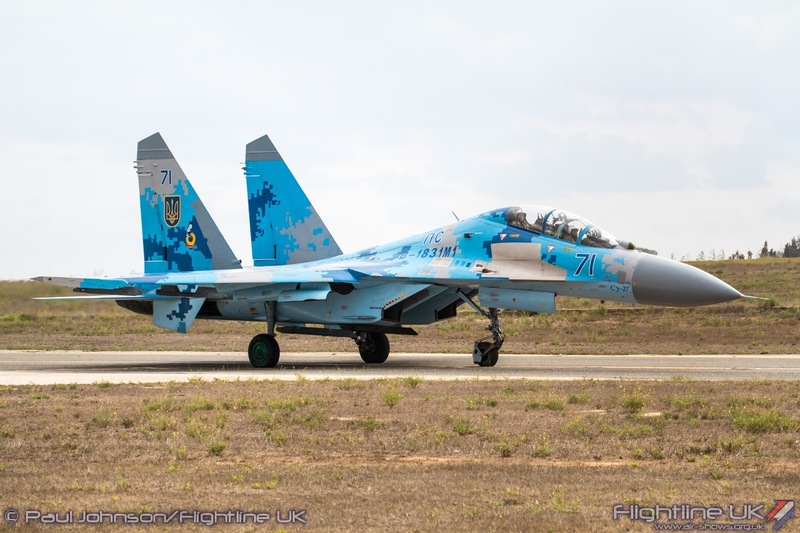 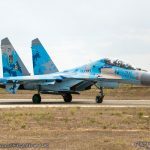 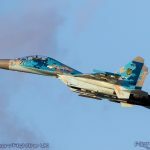 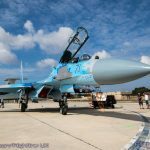 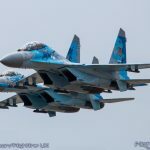 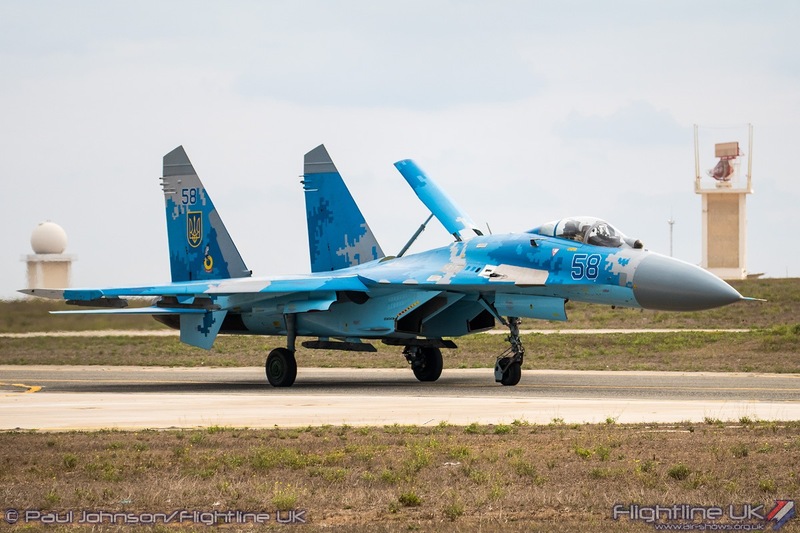 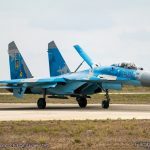 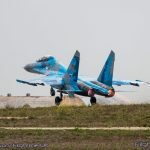 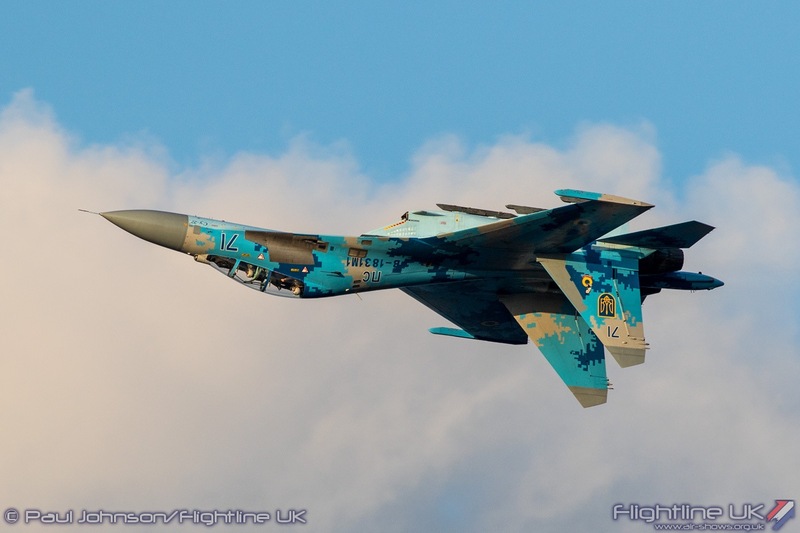 The Ukrainian bought two flavours of Su-27 with a standard single seat Su-27 Flanker-B joined by the Su-27UB Flanker-C two seat operation conversion trainer. 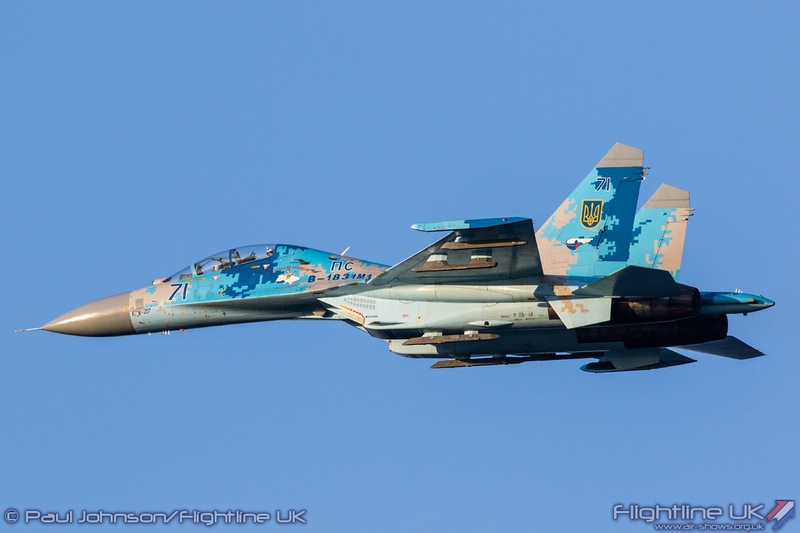 Both aircraft wore striking two-tone Blue and Grey digital camouflage and looked pristine. 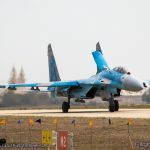 Even on the ground, the Su-27 is perhaps the most imposing of fighter aircraft with a very purposeful stance and its huge central “sting” sitting between the Saturn-Lyulka AL-31F jet engines. 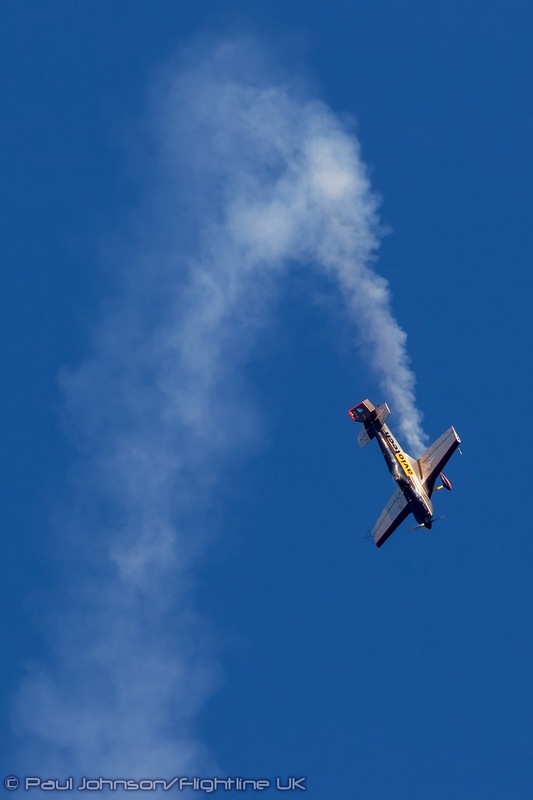 Sadly, due to poor weather on the Sunday the flying display only took place on the Saturday. 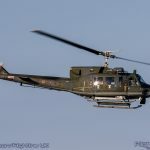 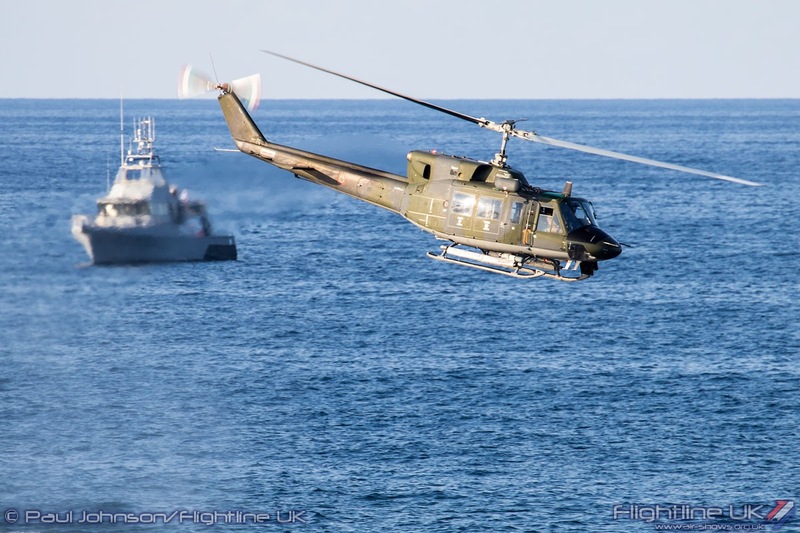 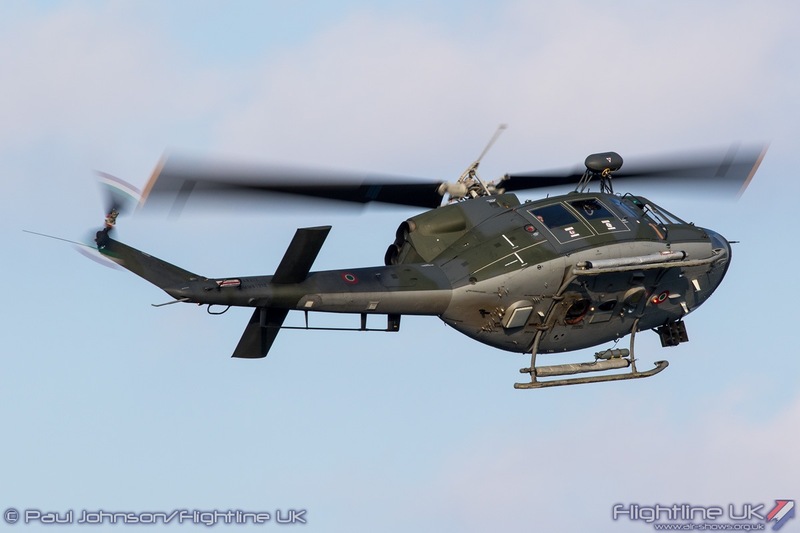 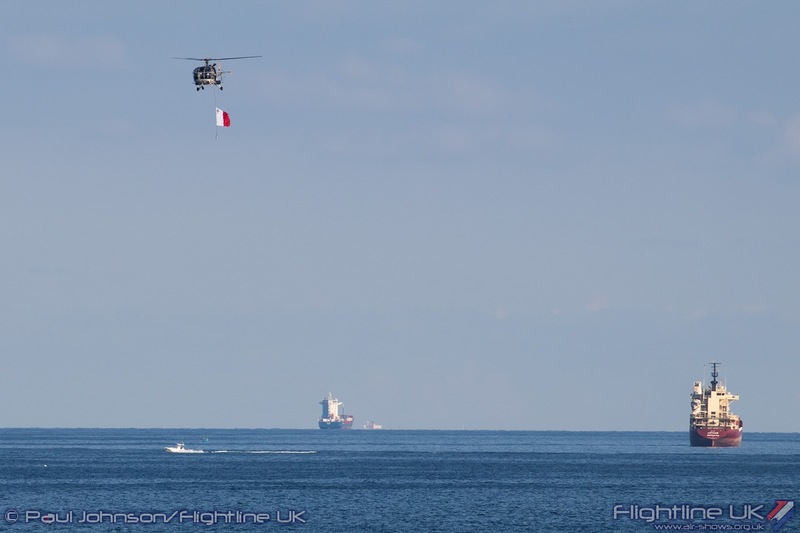 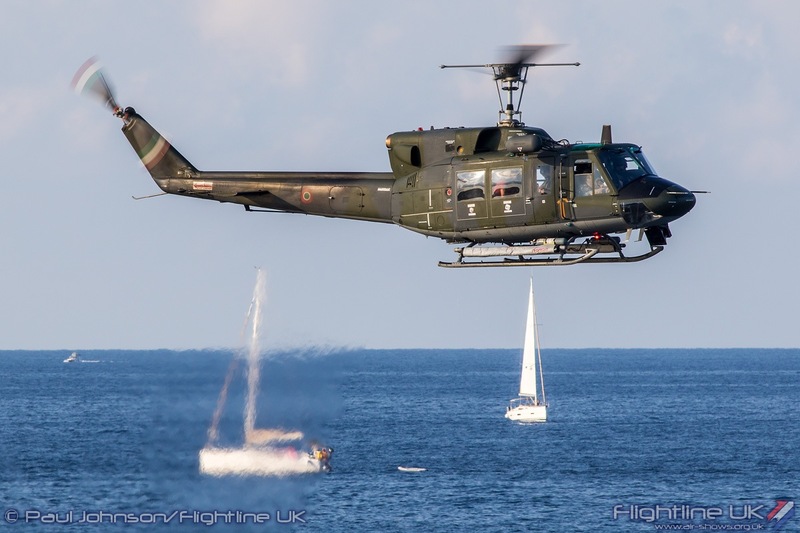 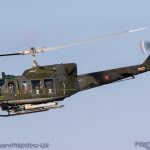 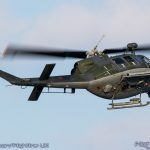 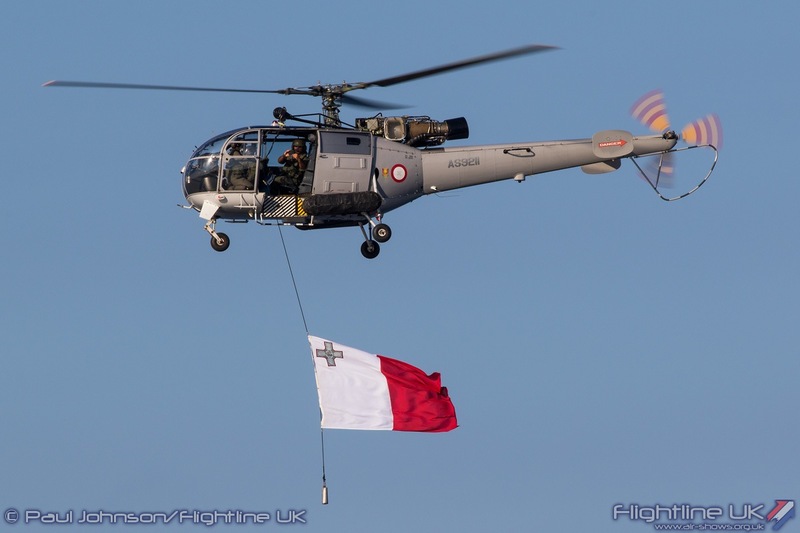 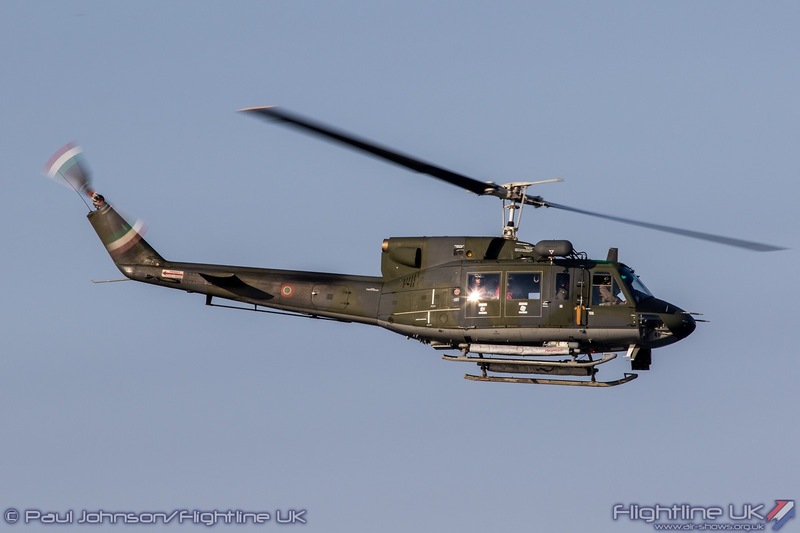 It opened in traditional manner with the Sud-Aviation SA316B Alouette III of the AFM performing a flypast with the Maltese flag flying from the aircraft’s winch. 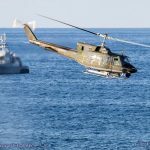 The Alouette IIIs are due for retirement very soon so the 2016 Airshow may have seen the type’s last participation at the event. 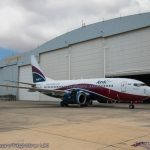 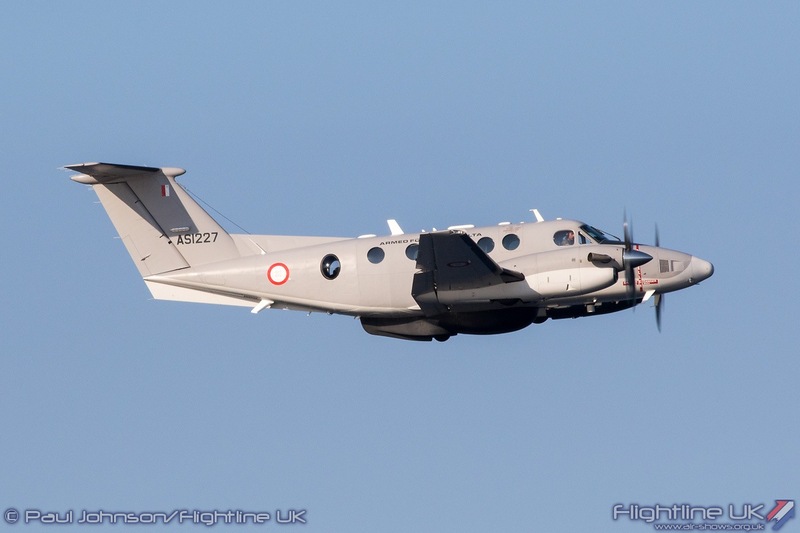 The second flying item also came from the AFM with their unique duo of Beechcraft King Air B200 and AgustaWestland AW139. 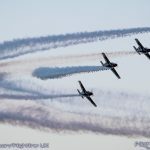 The pairs opening formation flypast was particularly tight and it is very rare to see such close formation from fixed-wing and rotary-wing aircraft flying together. 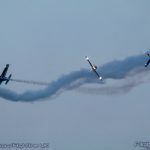 Following an on-crowd split each aircraft then performed a short solo routine. 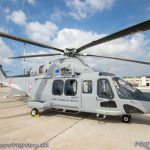 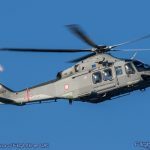 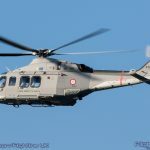 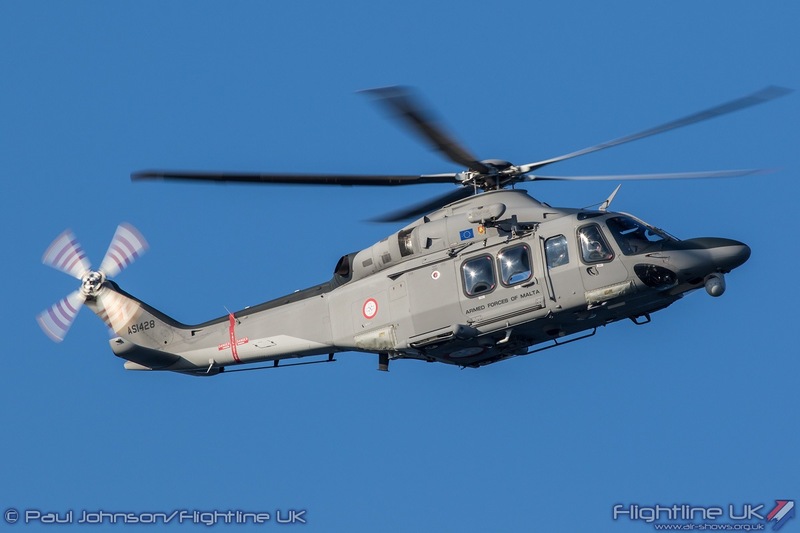 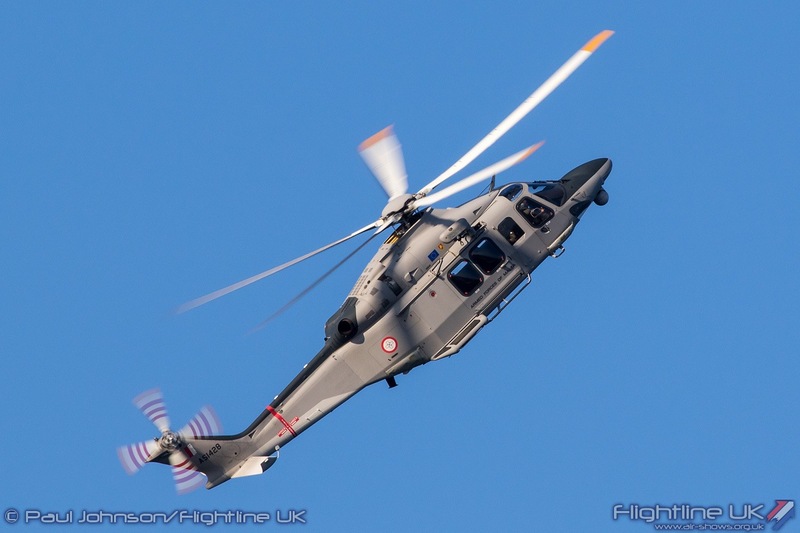 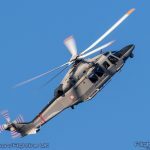 The AW139 is the latest type to join the AFM and with take on the search and rescue role of both the AFM’s Alouette and the Italian AF’s Malta detachment. 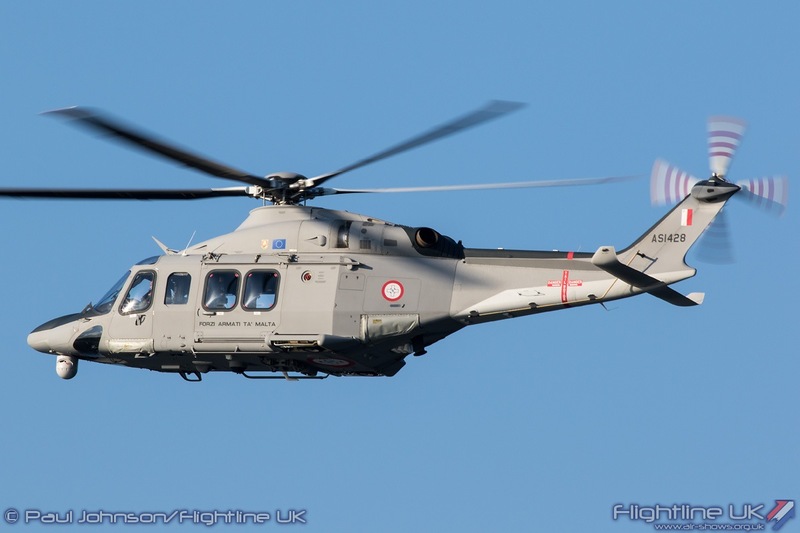 The AFM will eventually operate three AW139s from MIA. 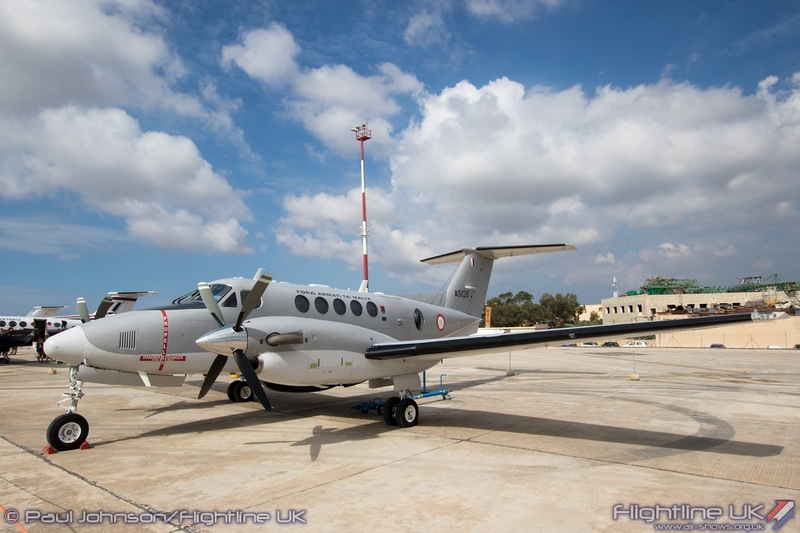 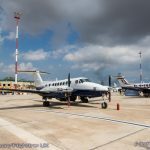 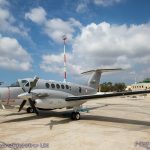 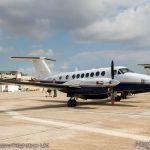 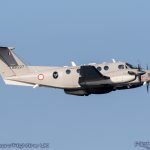 The King Air B200 provides the Armed Forces of Malta with a long range maritime patrol aircraft for surveillance of the waters surrounding the Maltese Islands. 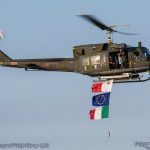 The Italian Air Force has supported the Maltese Islands for over 28 years with the Missione Italiana Assistenza Tecnico Militare di Malta (MIATM). 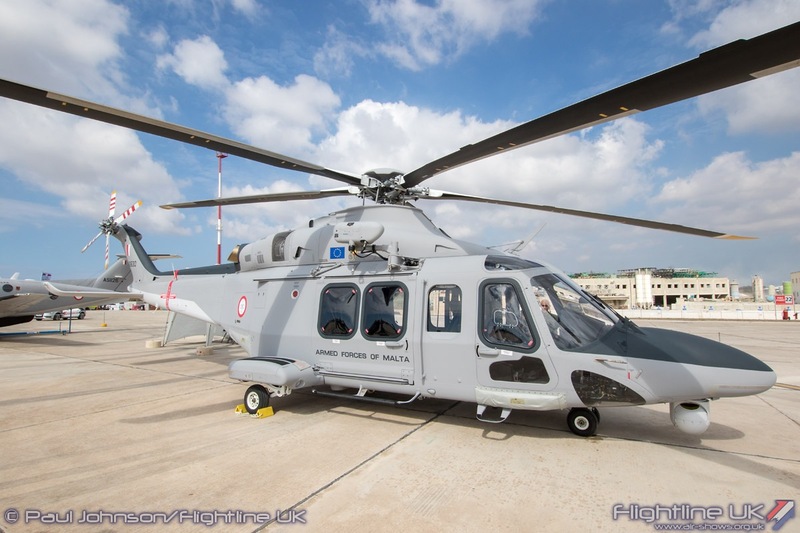 This unit flies the Agusta/Bell AB212 helicopter in the long-range Search and Rescue role alongside the Armed Forces of Malta. 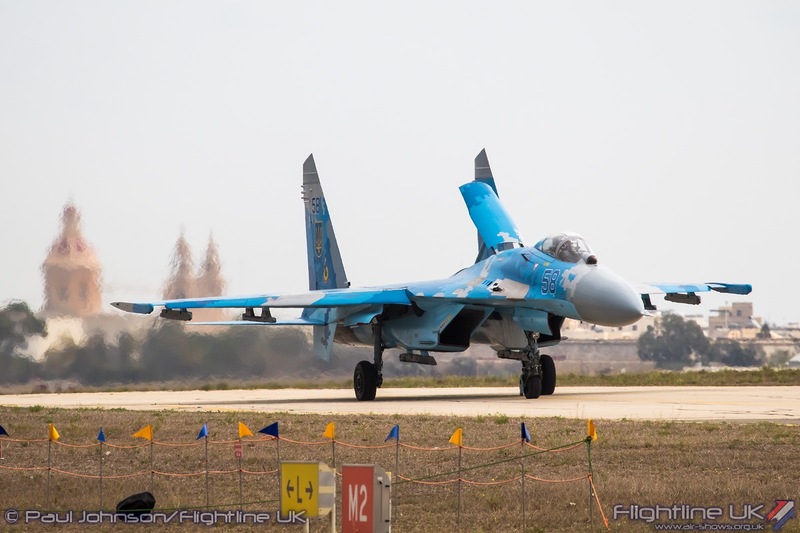 The unit however will soon leave Malta and the 2016 International Airshow marked the final display by the unit. 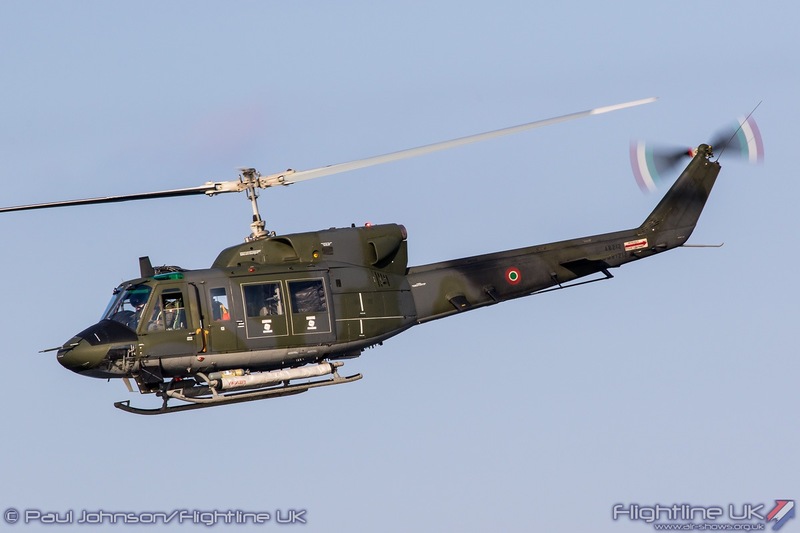 The AB212s are expected to have left by the end of October 2016 and all Italian personnel by January 2017. 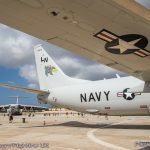 The move to a coastal location allowed the MIATM crew to show off what they really do while on maritime missions. 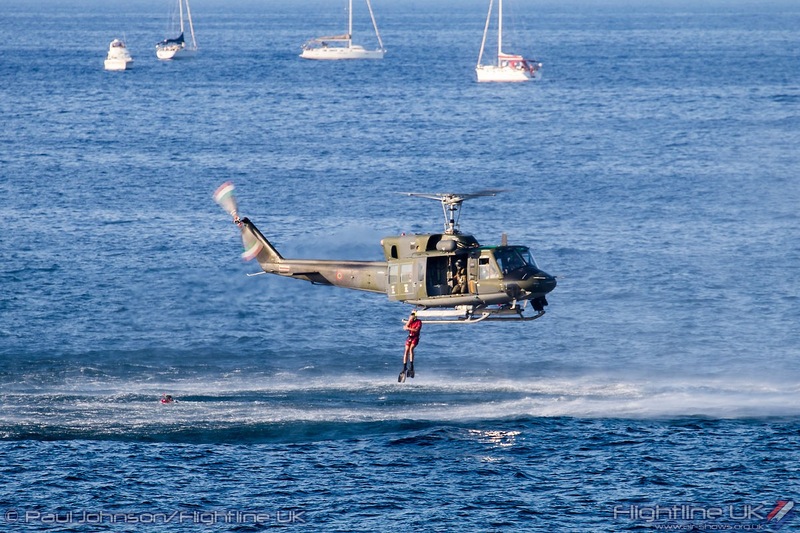 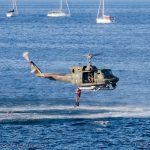 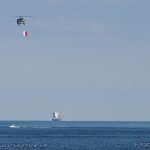 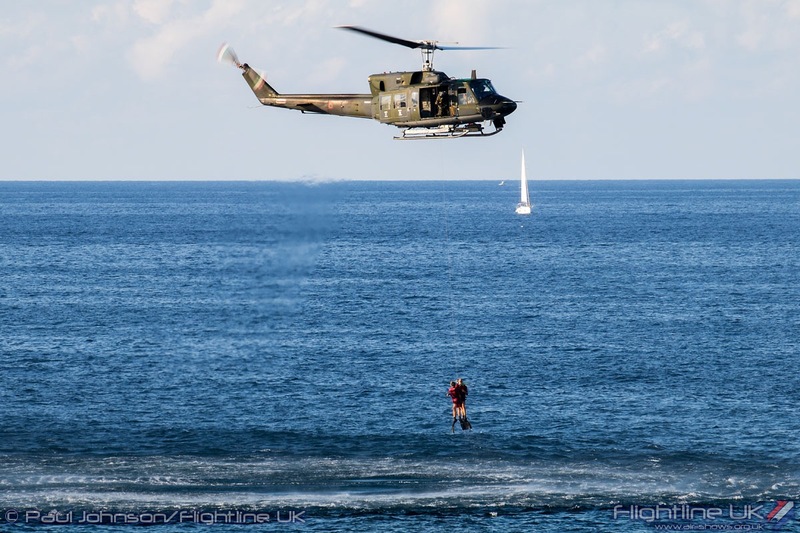 The AB212 flew low over the water to dispatch a pair of divers before performing a winching demonstration from the sea. 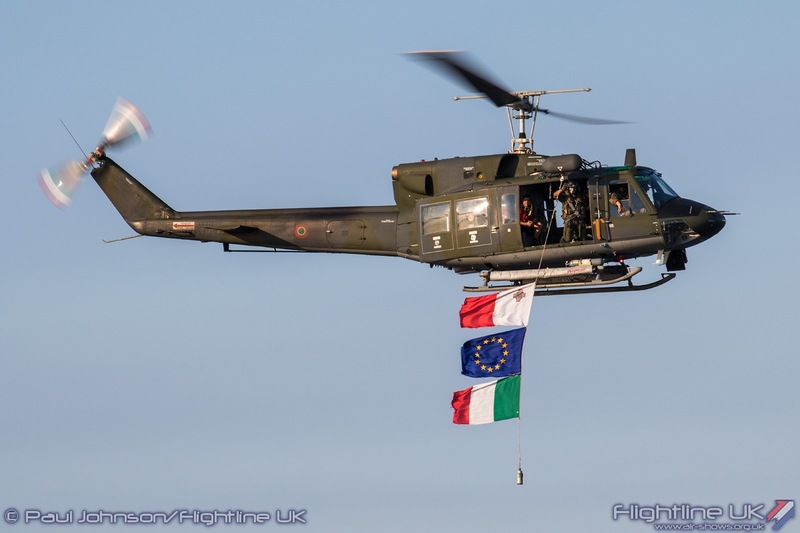 As ever the Italians closed their routine with a flag-flying flypast featuring the Italian, Maltese and EU flags. 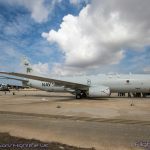 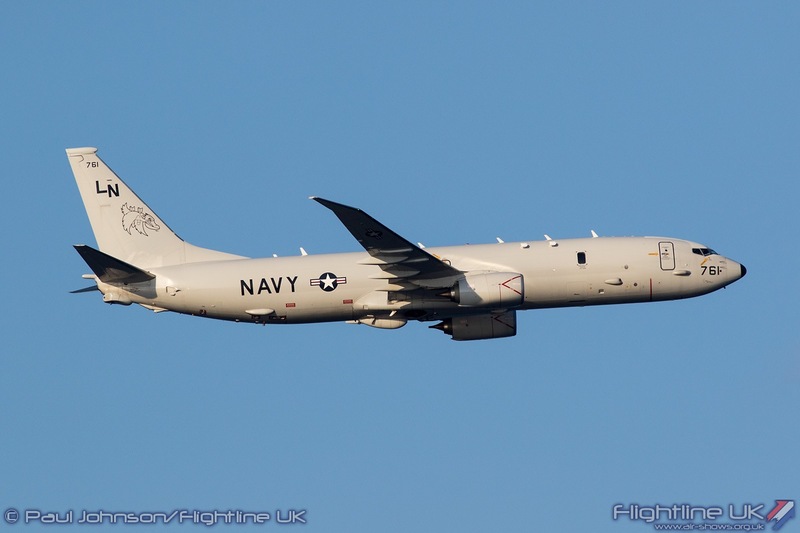 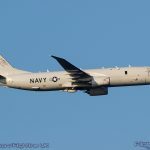 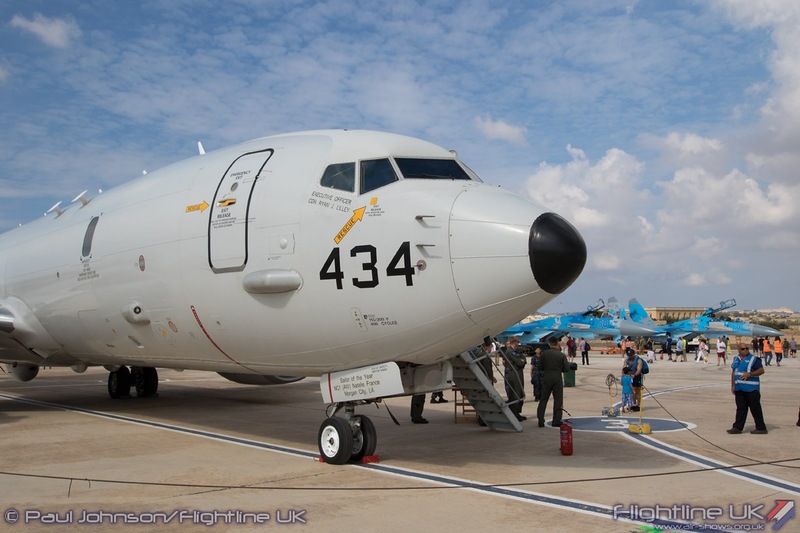 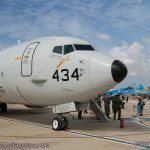 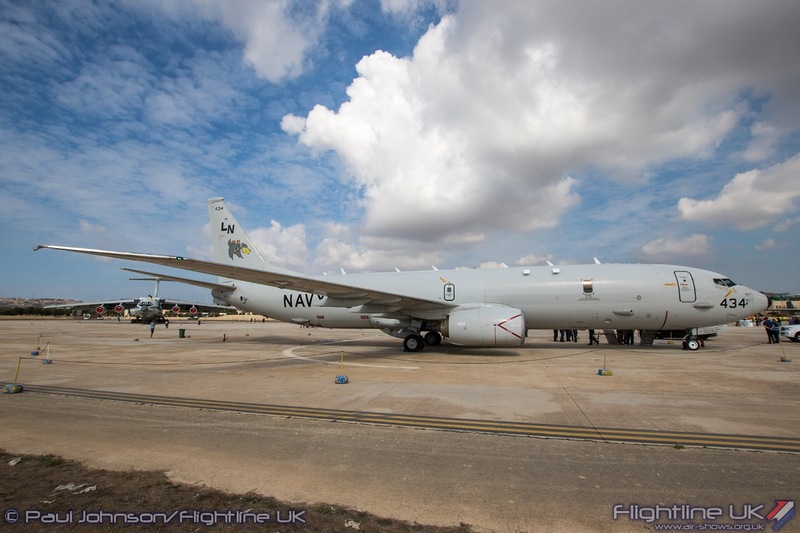 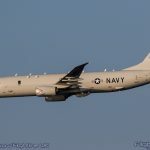 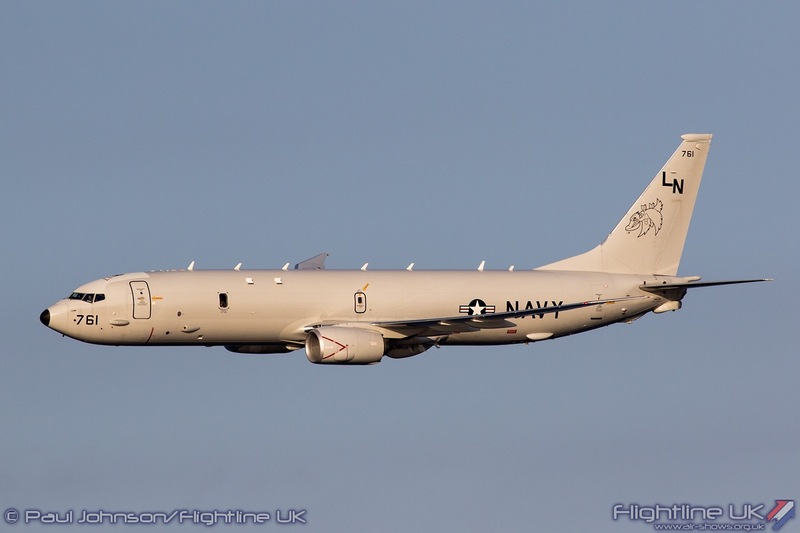 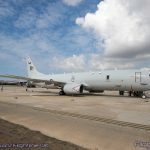 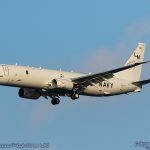 As well as the aircraft on static display, VP-45 of the US Navy contributed a further Boeing P-8A Poseidon to the flying display. 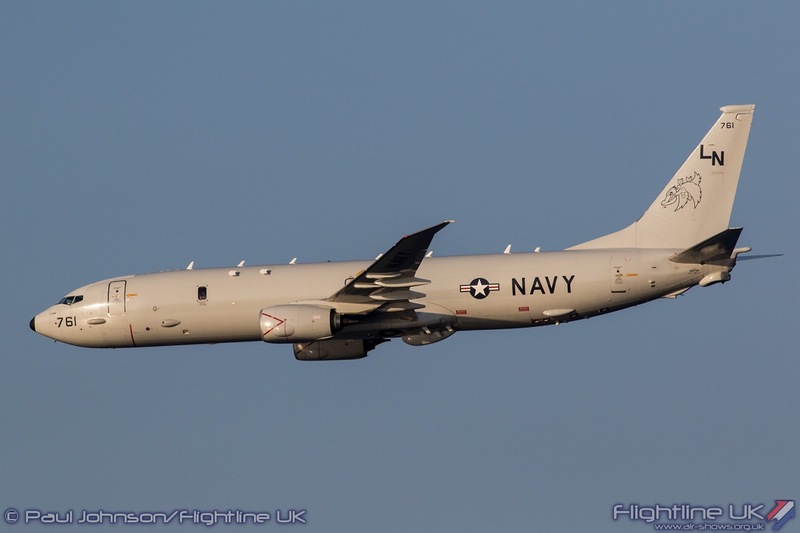 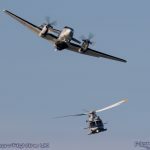 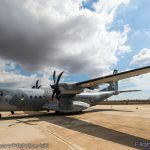 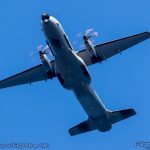 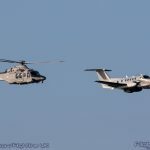 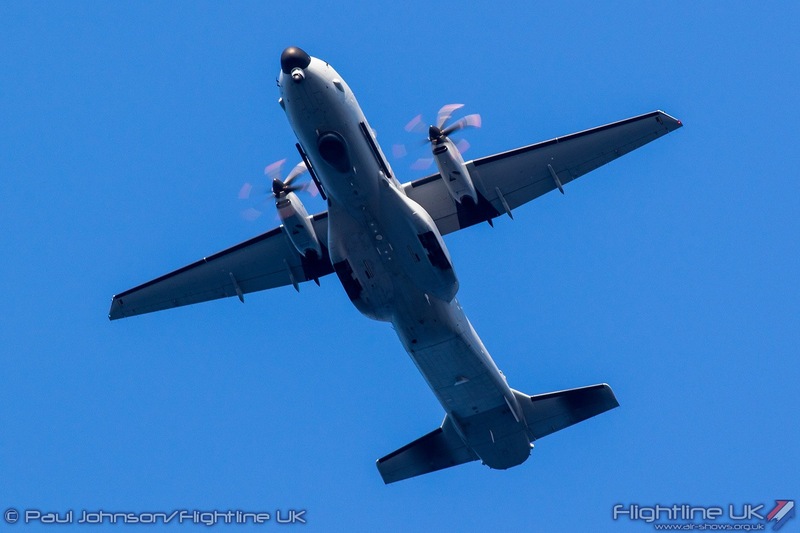 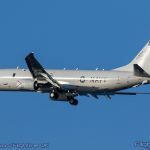 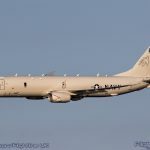 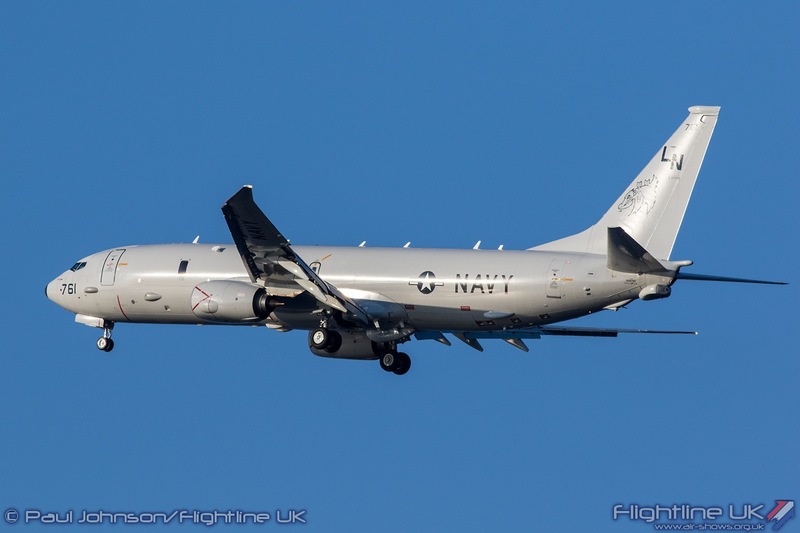 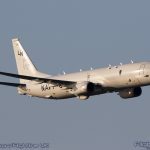 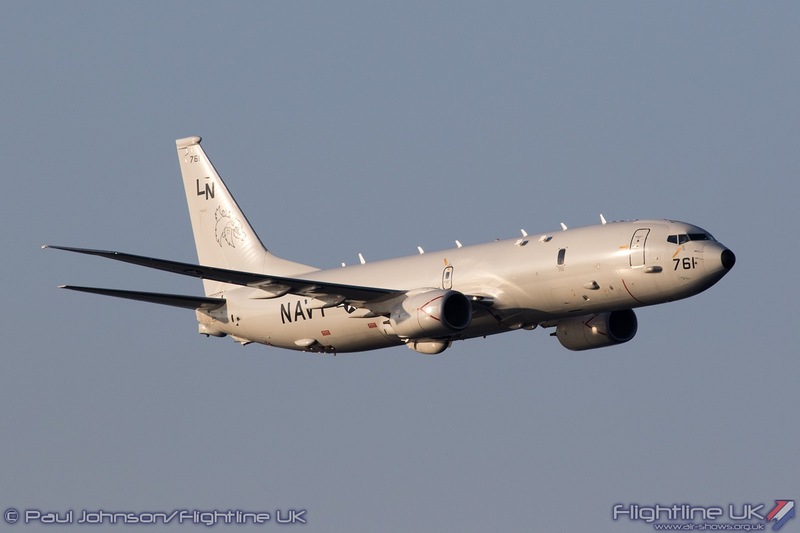 The crew performed four flypasts along the SmartCity coastline in various configurations showing of the clean lines of the new Maritime Patrol Aircraft which looked sublime in the golden light of the Maltese sunset. 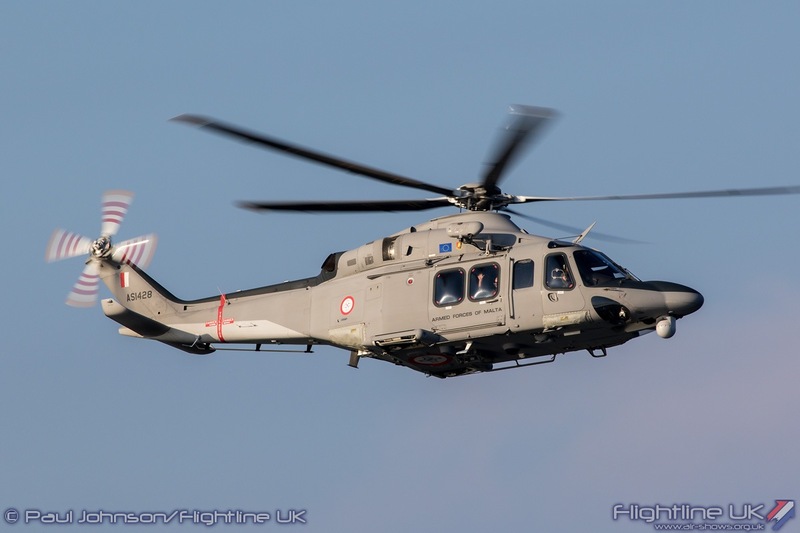 A break from the military flying was provided by the ‘Silver Chicken’ from Italy. 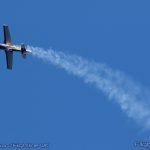 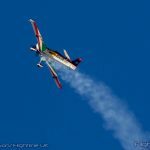 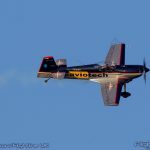 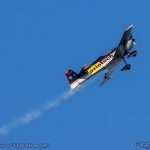 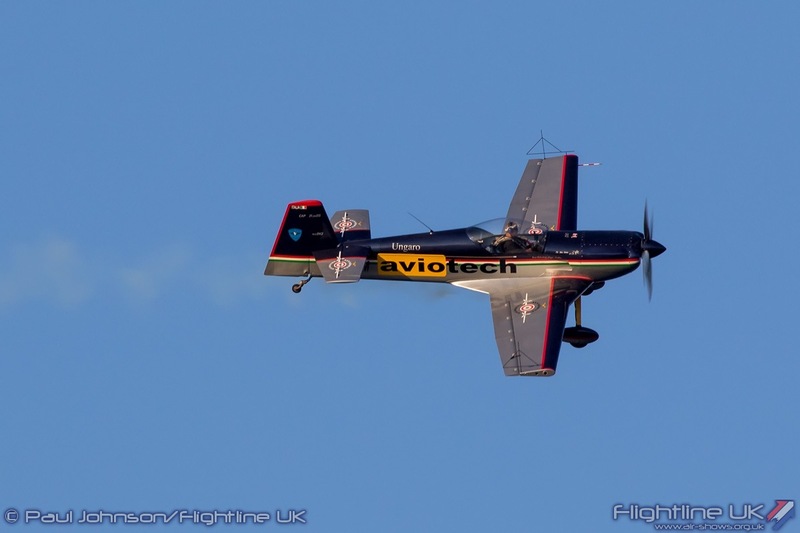 This is actually a Mudry CAP-21DS flown by champion Italian aerobatic pilot Luca Salvadori and has been a regular at European airshows for many years. 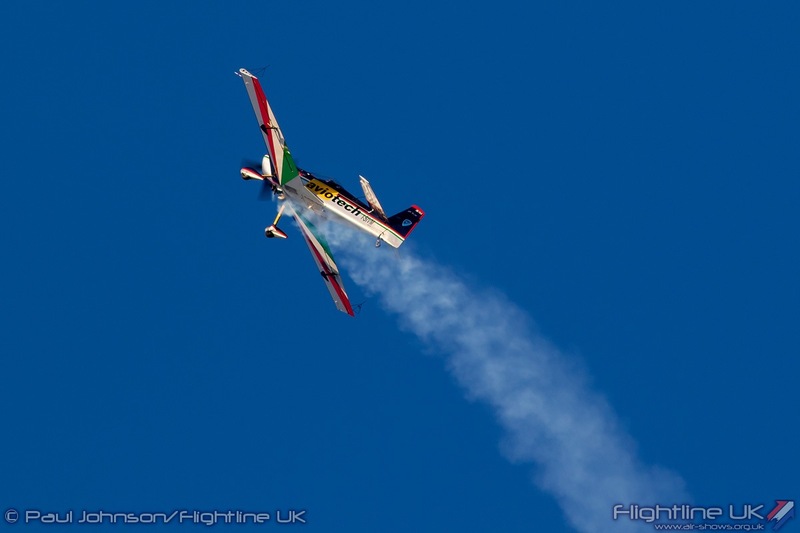 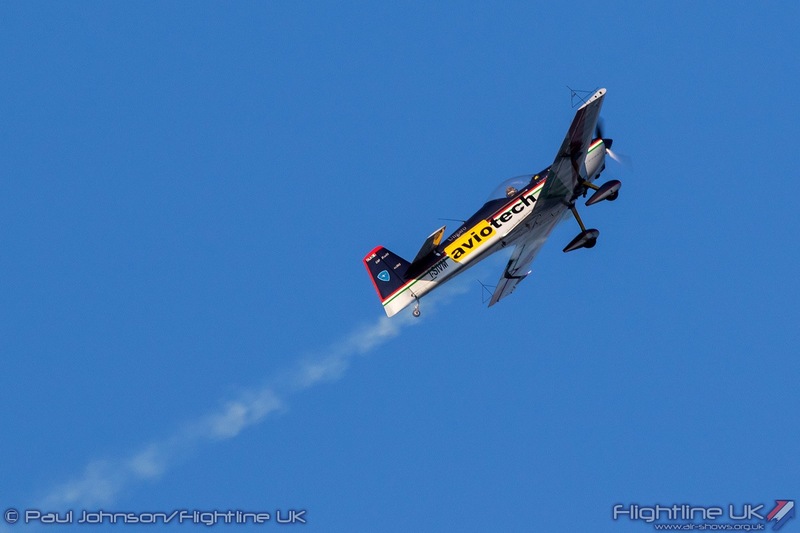 Luca flew a flowing routine of competition style aerobatic showing off the crisp handling of well-liked CAP. 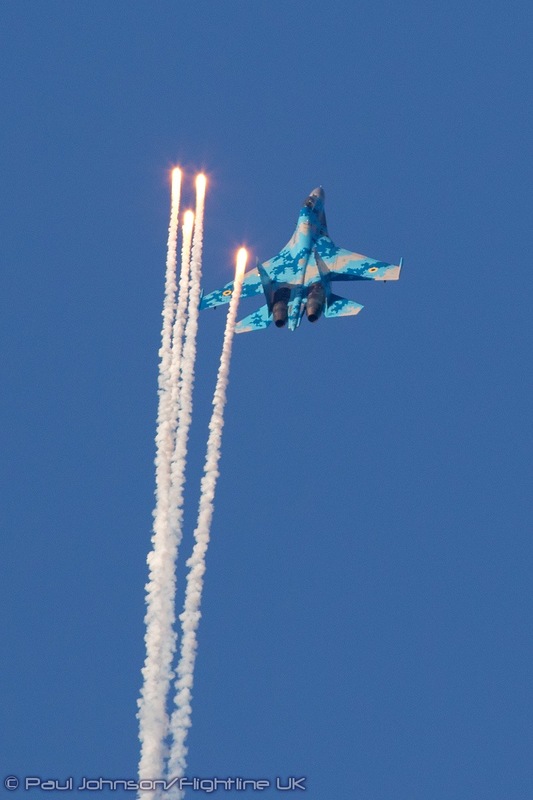 The final two military display acts had a distinctly Eastern-European theme. 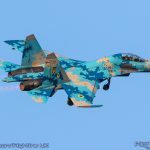 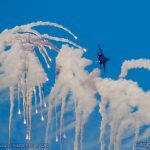 First was perhaps the most keenly anticipated display of the show, the Ukrainian Air Force Sukhoi Su-27UB Flanker-C solo display. 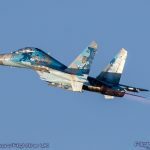 For many like the author, the Su-27 is the ultimate jet for solo displays thanks to its sheer size, noise and agility. 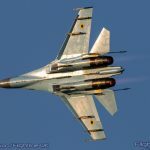 In the hands of the Russian Test Pilots team, it was the highlight for many European shows in the early to mid-1990’s showing off just how advanced the aerospace industry of the former Soviet Union was. 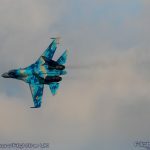 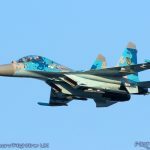 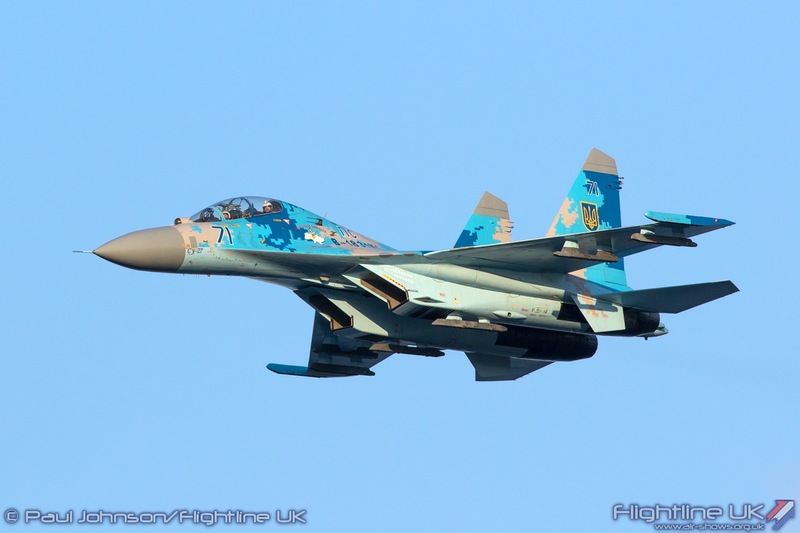 During the late-1990’s, the Ukrainian Air Force first started appearing at western shows with the Flanker too and were part of a golden era of military airshows. 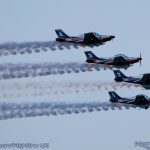 Their current solo display rekindles many of those memories. 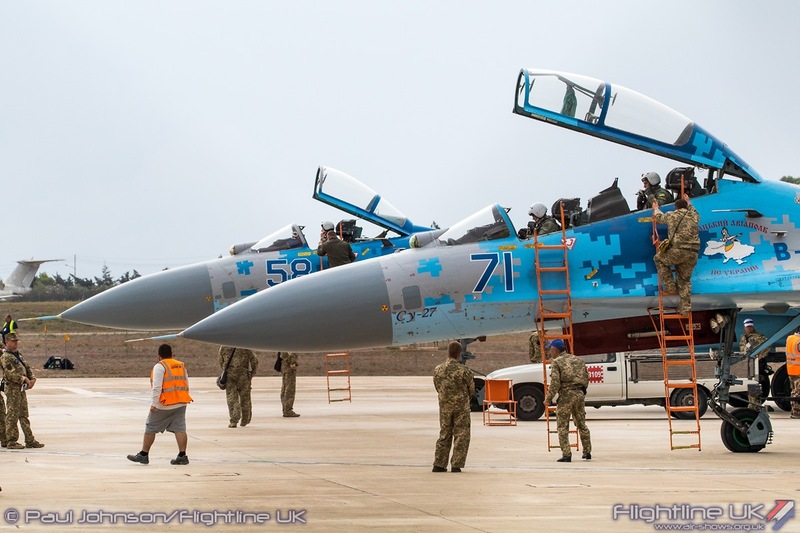 Now a much smaller air force, they are taking a great deal of care of their remaining aircraft. 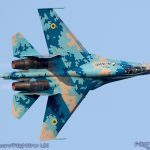 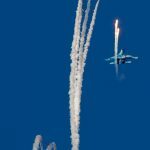 The Ukrainian crew’s display may be a little more measured that those of the 1990’s, but it was still one of the most impressive solo jet display of recent times. 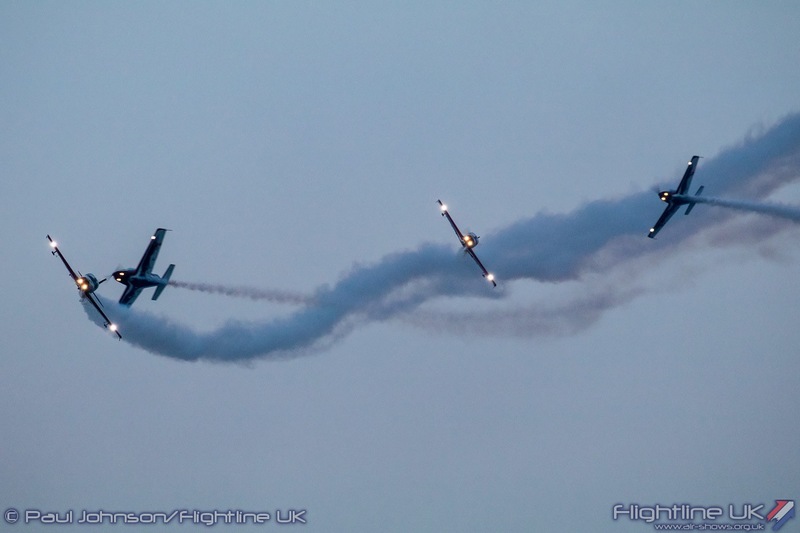 The display included the trademark tailslide during their display both parallel too and with the aircraft back to the crowd. 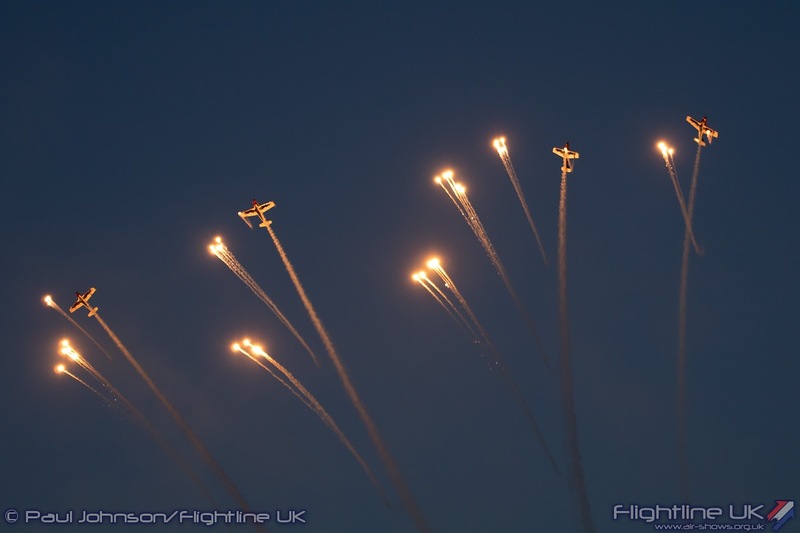 On both occasions the crew highlighted the manoeuvre with flares. 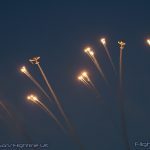 Their final flypast and break also included very liberal use of flares for a very fitting and eye-catching finale to their show. 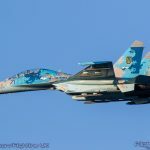 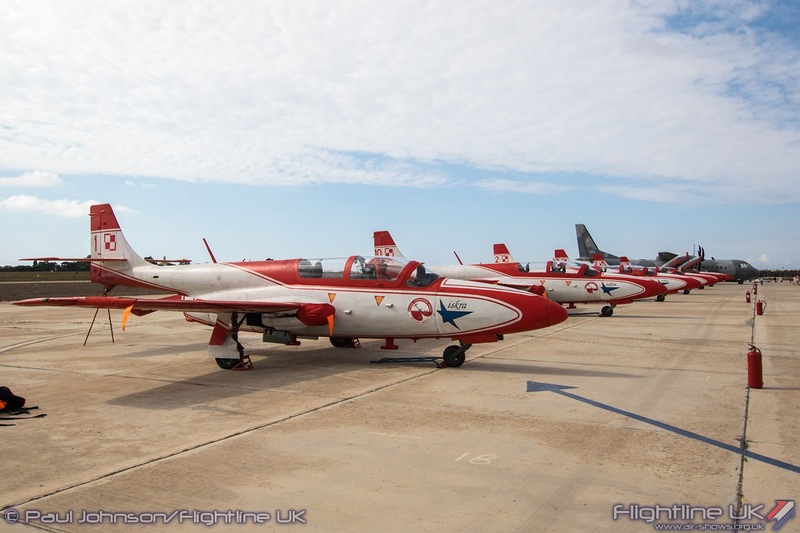 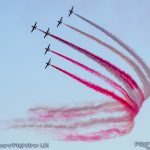 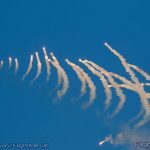 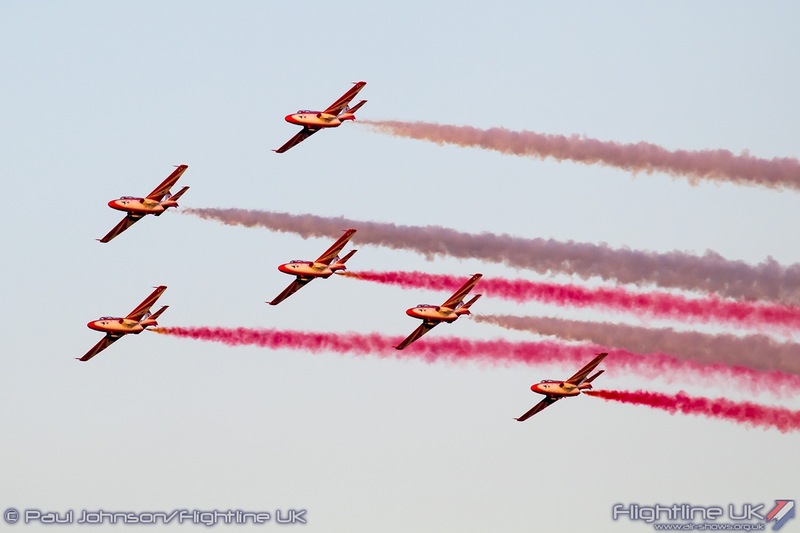 Following on from Team Orliky’s visit last year, the Polish Air Force’s Bialo-Czerwone Iskry national display team made their Malta debut in 2016. 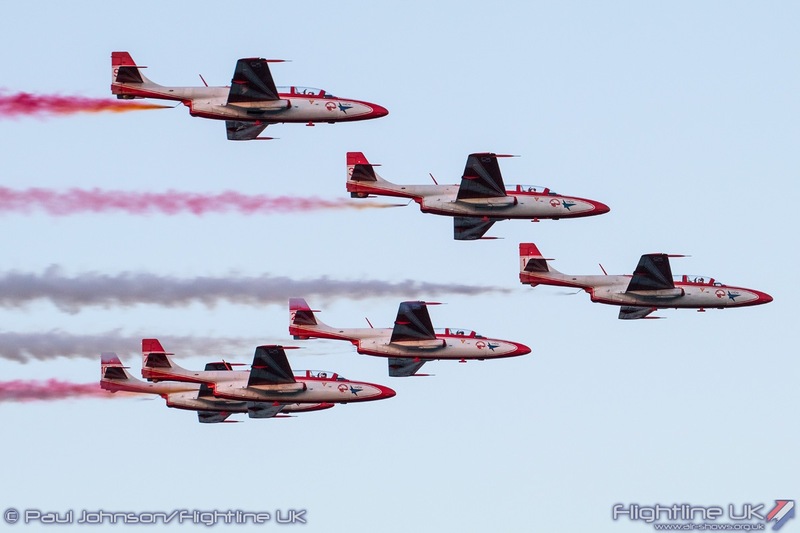 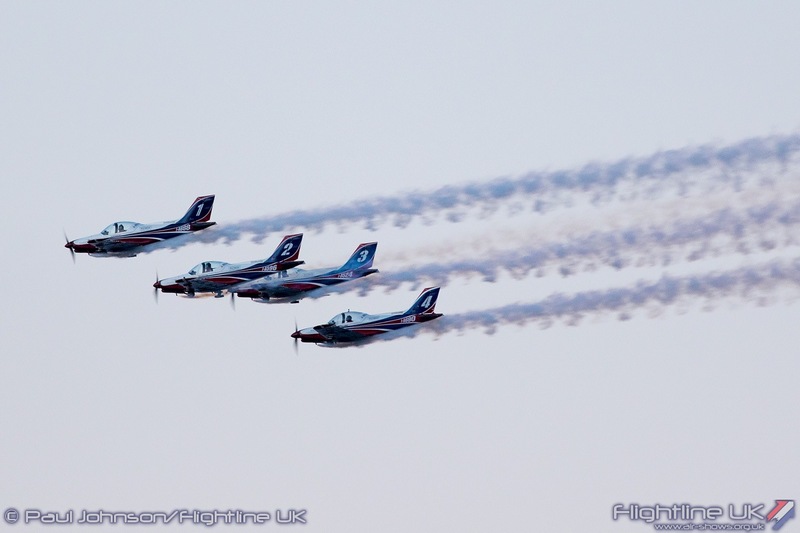 The team fly the PZL TS-11 Iskra, a Polish designed advanced trainer similar in vintage to the Aero L-29. 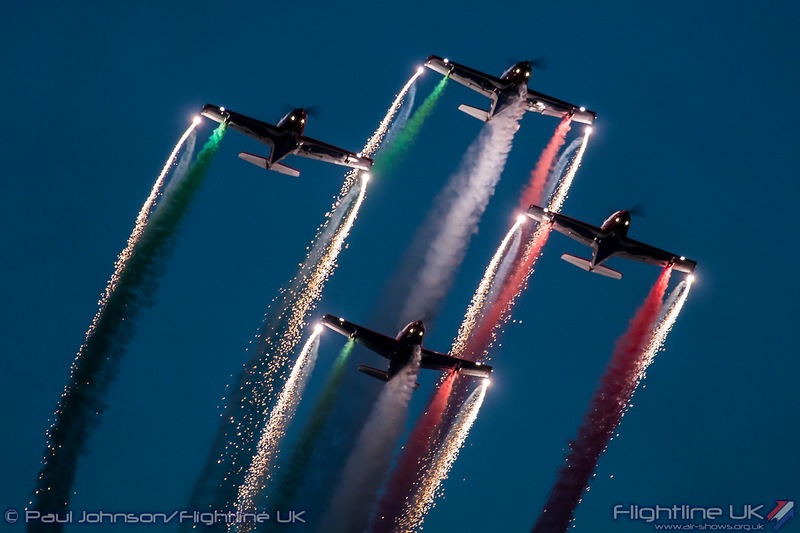 The team’s name translates into ‘Red and White’ sparks and they have been somewhat infrequent visitors to European airshows. 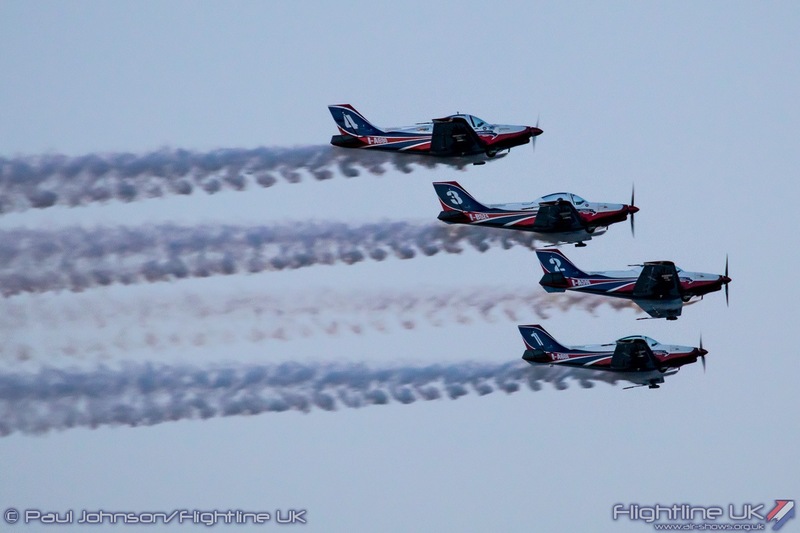 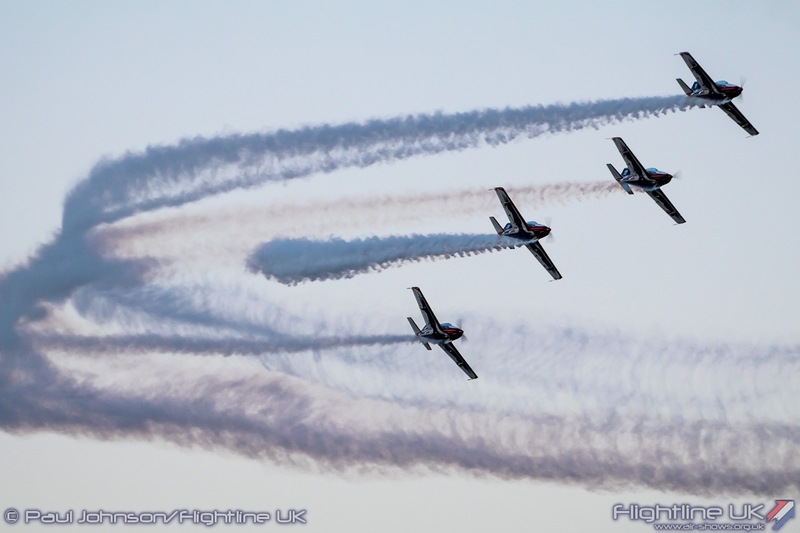 As they have little experience at displaying at seafront shows, the team performed a restricted display of flypasts at sunset to close the daytime flying. 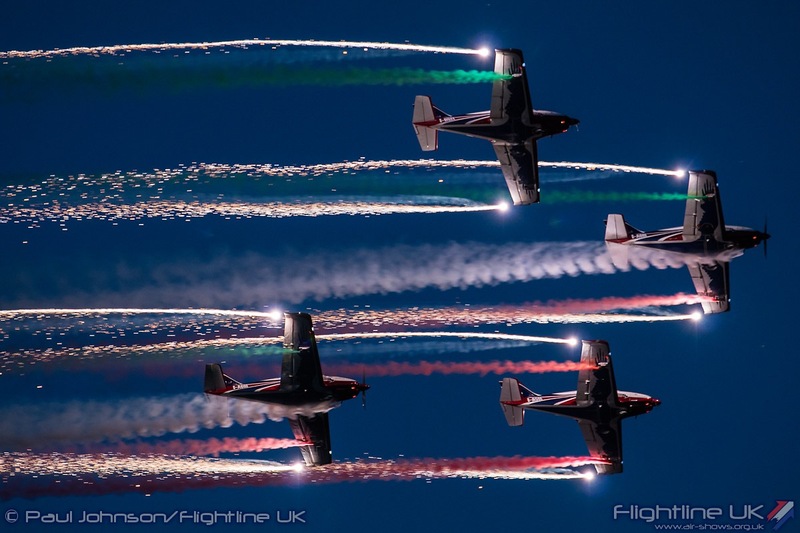 The show was closed by another civilian team from Italy, this time the famous Pioneer Team flying the Alpi Pioneer 300. 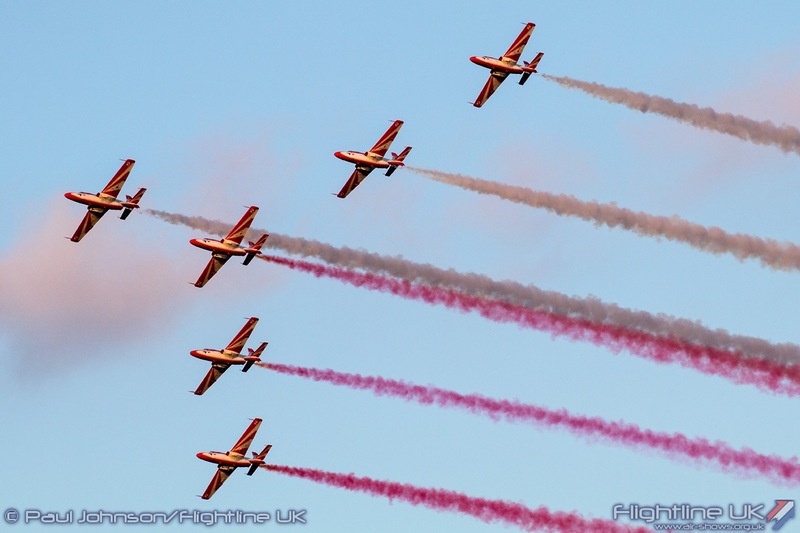 The Pioneers are well known for their colourful displays throughout Europe. 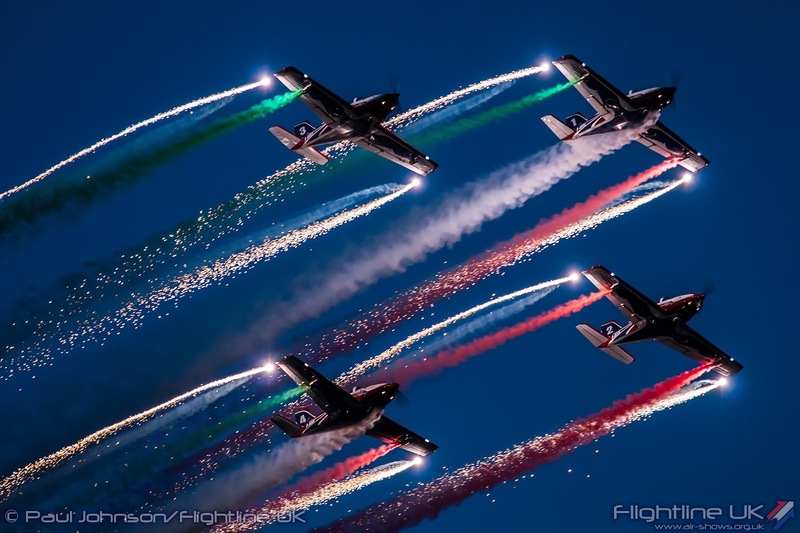 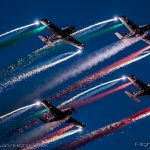 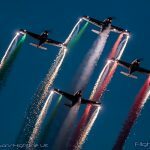 They have been aided by the Italian National Display, Il Frecce Tricolori, to develop their formation skills and always fly a very nice presentation of formations and tail-chasing. 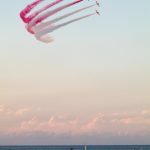 Sunset in Malta is very quick with the sky going from a relatively light backdrop to dark very quickly. 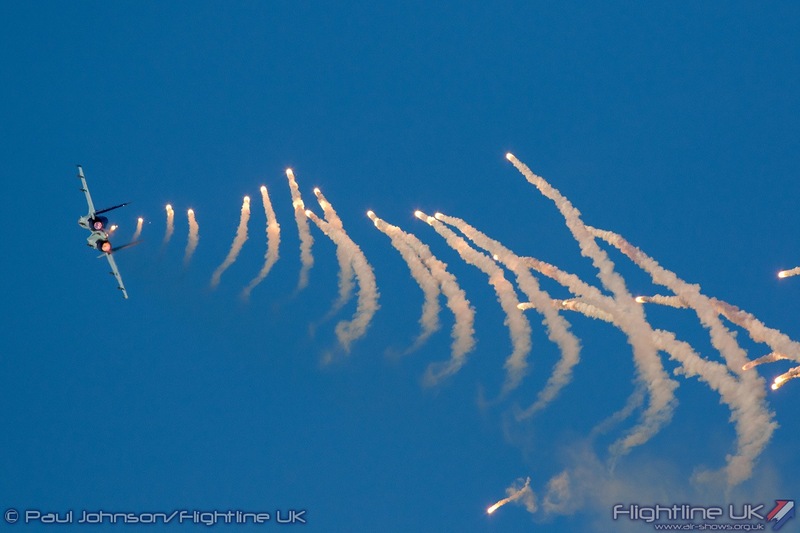 This helped make the Pioneer’s display that much more special with their main formation display conducted in the light. 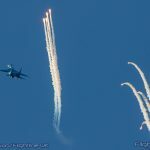 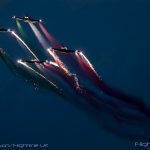 By the time of their final few manoeuvres, it was like someone switched off the light which was perfect for their spectacular bomb-burst with flares and their rousing finale formation trailing Green, White and red smoke plus underwing pyros! 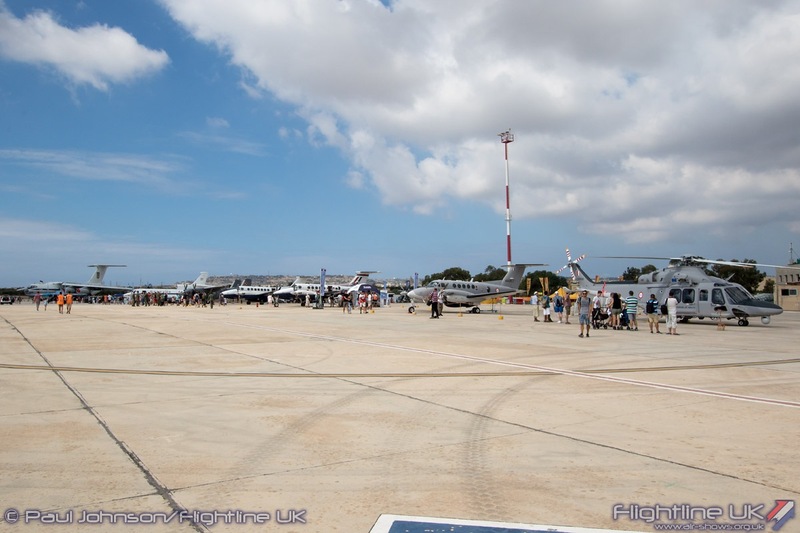 Despite all the changes to the event, the Malta Aviation Society volunteers prevailed to produce a very enjoyable day on the Saturday helped by good weather. 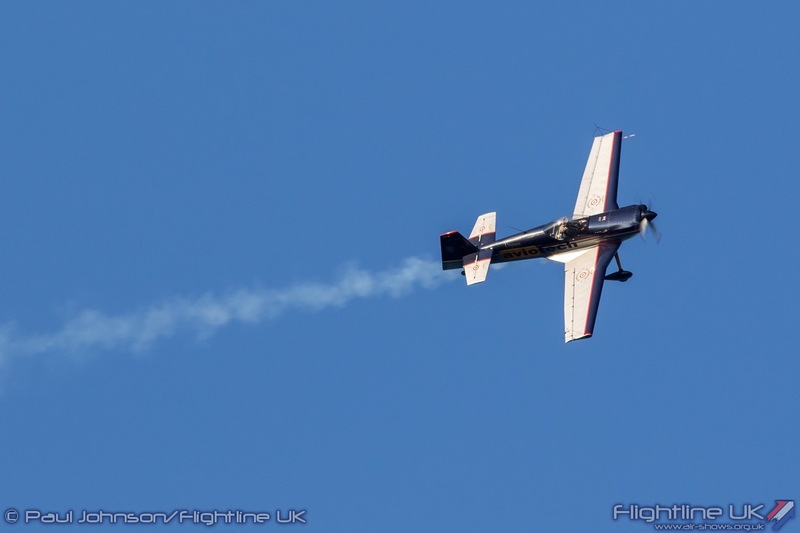 It was a shame that the weather dealt such a cruel blow to the event on the Sunday as I was really looked forward to a second round of flying at SmartCity. 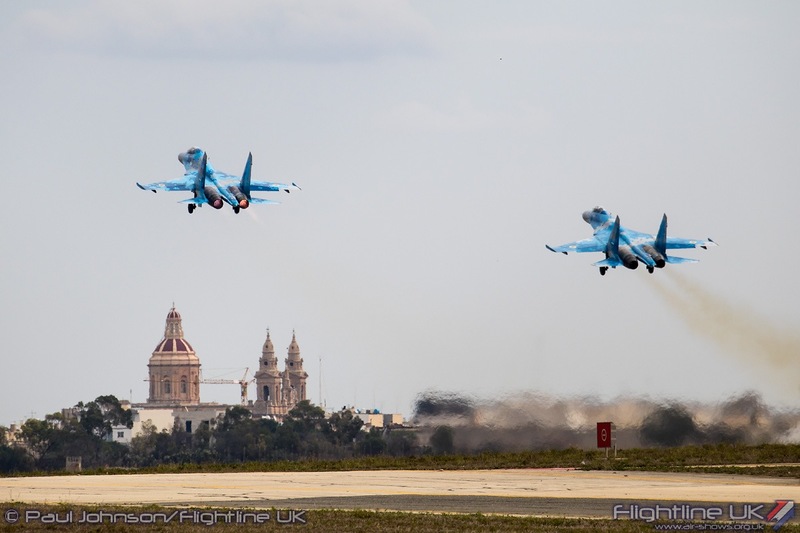 Wherever future Malta International Airshows are held, long may they continue. 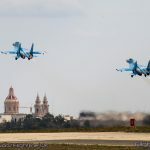 They are a credit to the Maltese Islands.